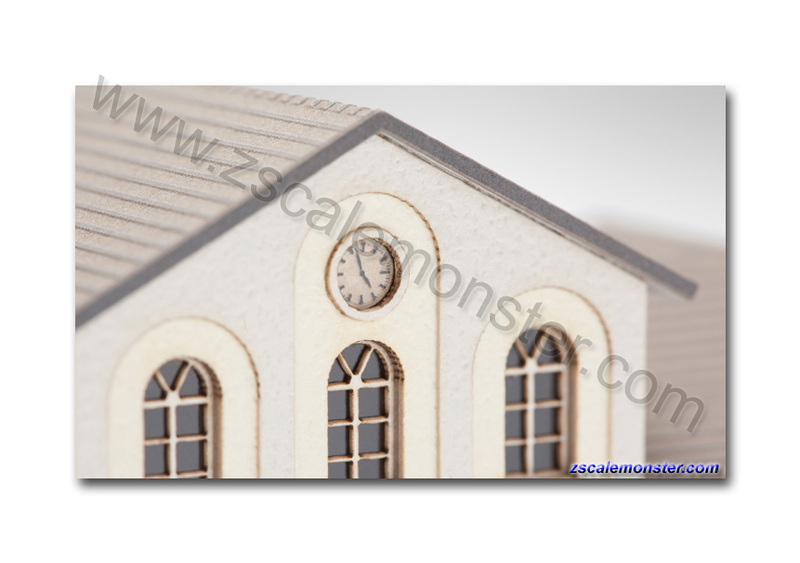 • From the combination of advanced material for centuries cardboard and innovative laser technology applied our artists Kits result of outstanding quality for highest demands - carefully and expertly designed, accurately and with great attention to detail. 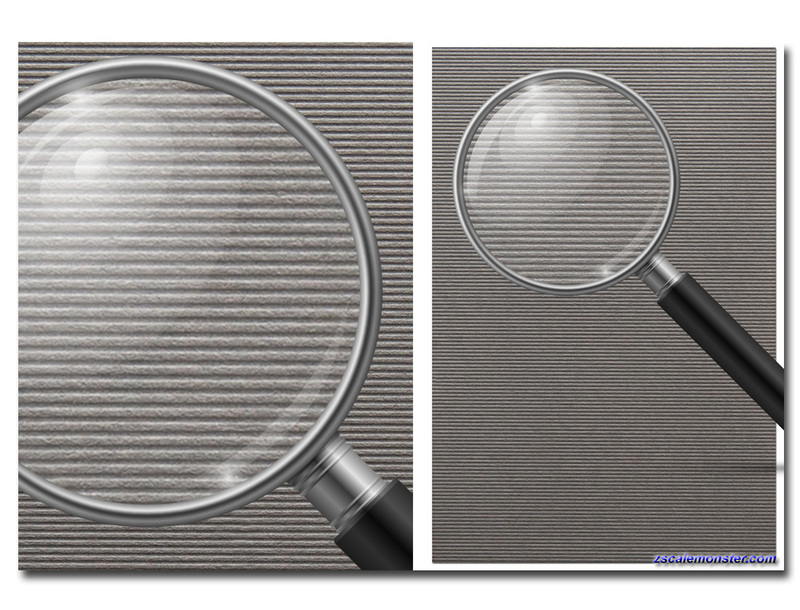 • The material we use is far superior to the widespread notions of carton: Colour fastness, exceptional surface textures, realistic colors and a high quality feel are some distinct advantages of this precious material. 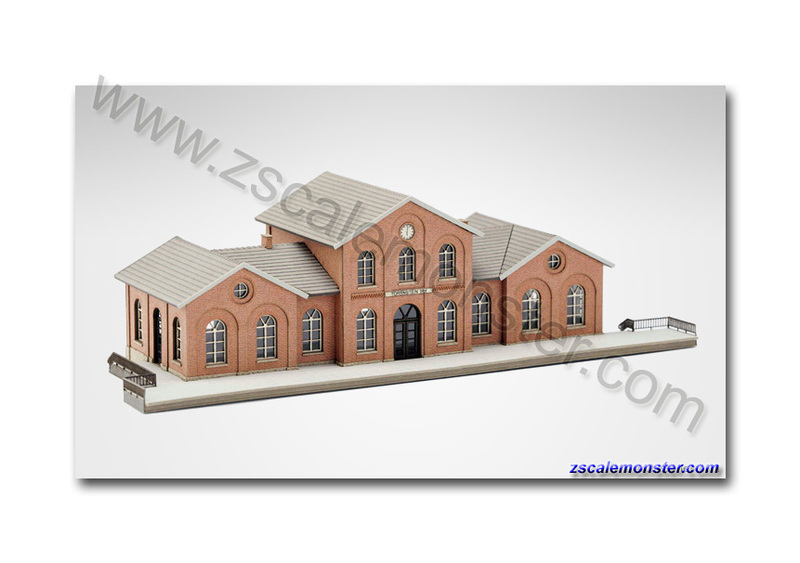 In addition, we work only with the professional architect software ArchiCAD, advanced control algorithm and precision lasers. 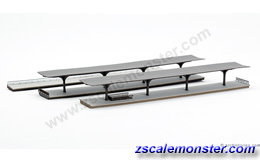 So we guarantee consistently high quality series to our customers. 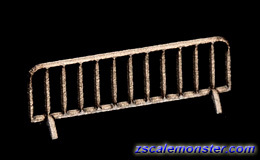 • Rustic design for construction sites, industrial sites etc. 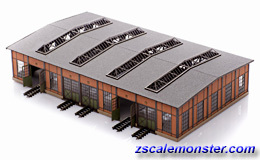 The locomotive shed of Zollern shows through its steel truss construction with Ziegelausfachungen (brick infill) a typical motif of the New Objectivity in industrial buildings of the early 20th century. 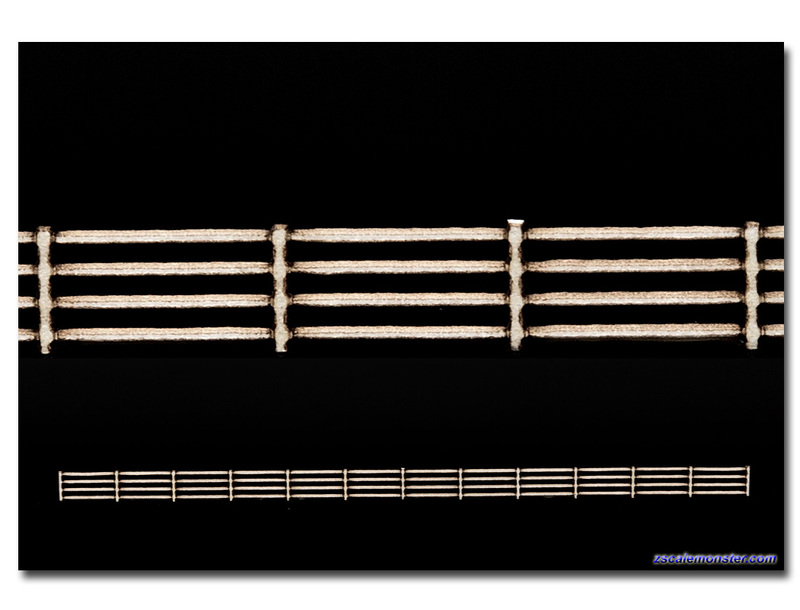 • 40% off MSRP • Limited time only! 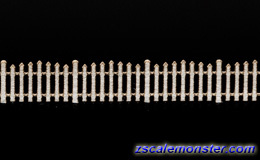 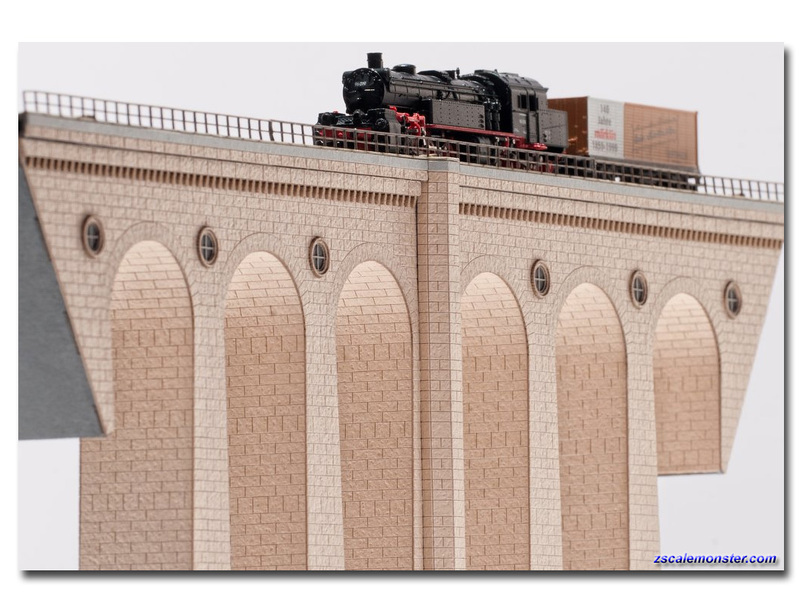 • Extremely delicate window bars, a barrel roof with detailed flue and the hinge-mounted entrance gate to meet even the largest locos in the smallest scale. 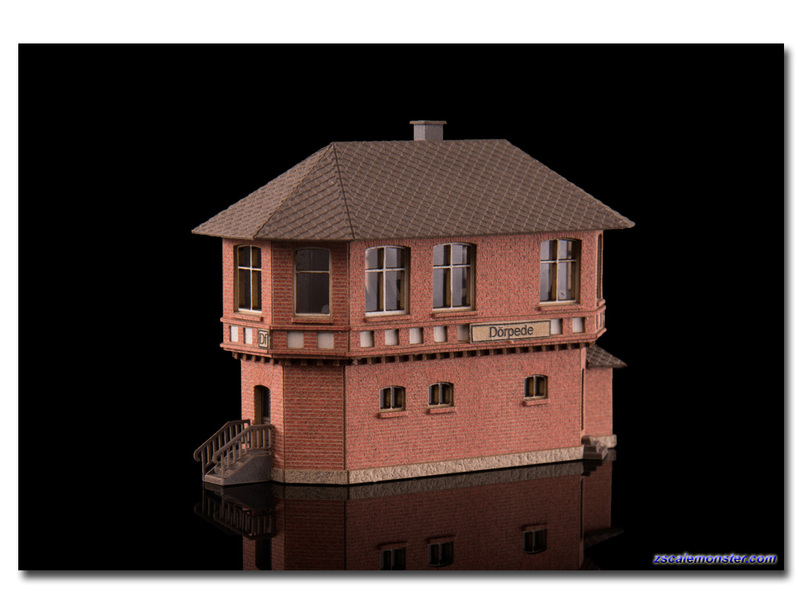 Signal Tower "D�rpede", with its space-saving design, fits well with the cramped conditions between tracks. 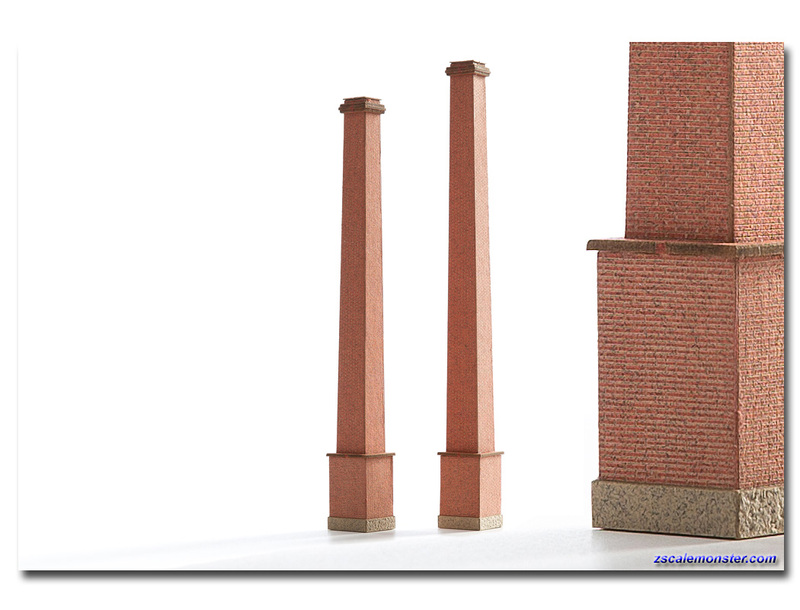 Above the substructure of brick construction rises a second story with a lever Bank inside. 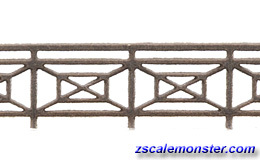 • The entry door is accessed via a lightweight filigree steel stair case and if desired the interior can be illuminated from above (not included). 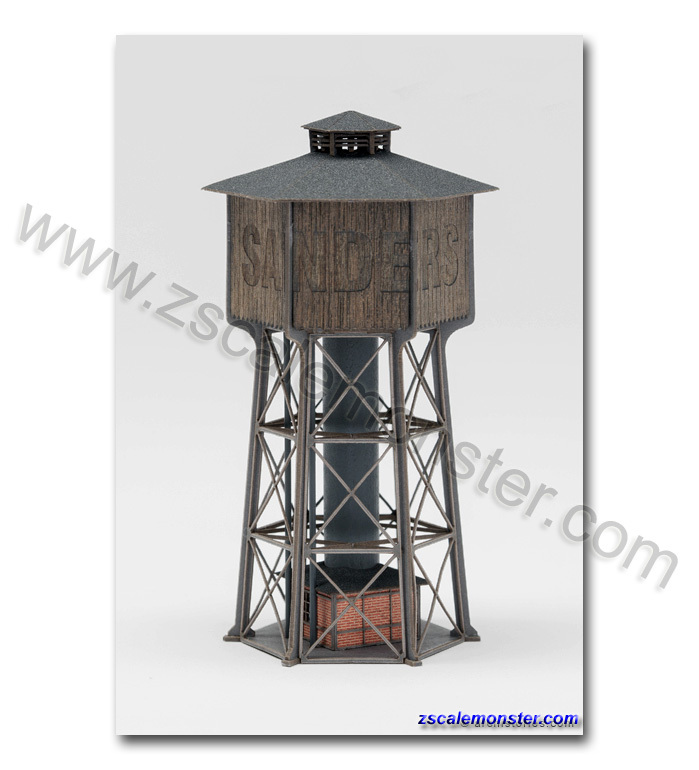 Plenty of details to make for a lively effect with the Signal Tower "D�rpede" Kit. 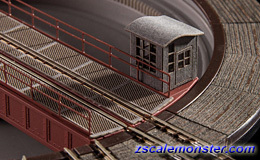 Signal Tower "Kallental", with its space-saving design, fits well with the cramped conditions between tracks. 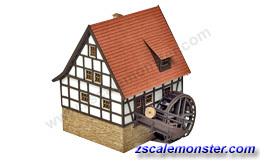 Above the substructure of brick rises the timber frame wooden construction with a lever Bank inside. 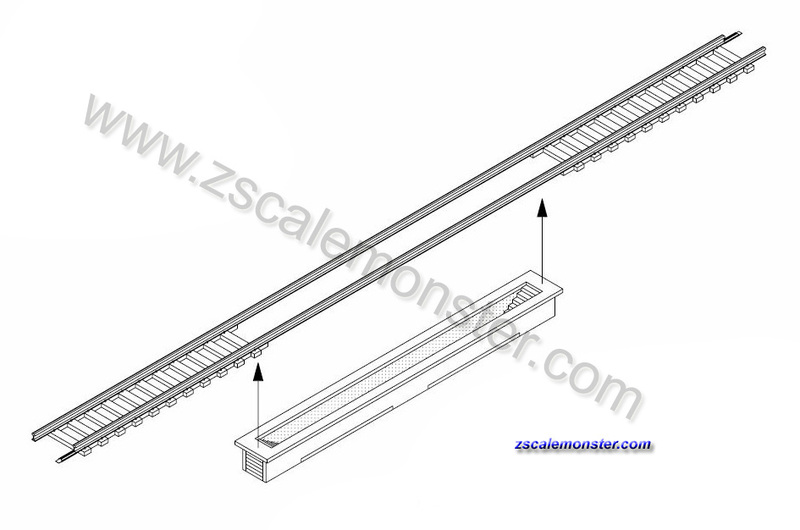 • The entry door is accessed via a lightweight filigree steel stair case and if desired the interior can be illuminated from above (not included). 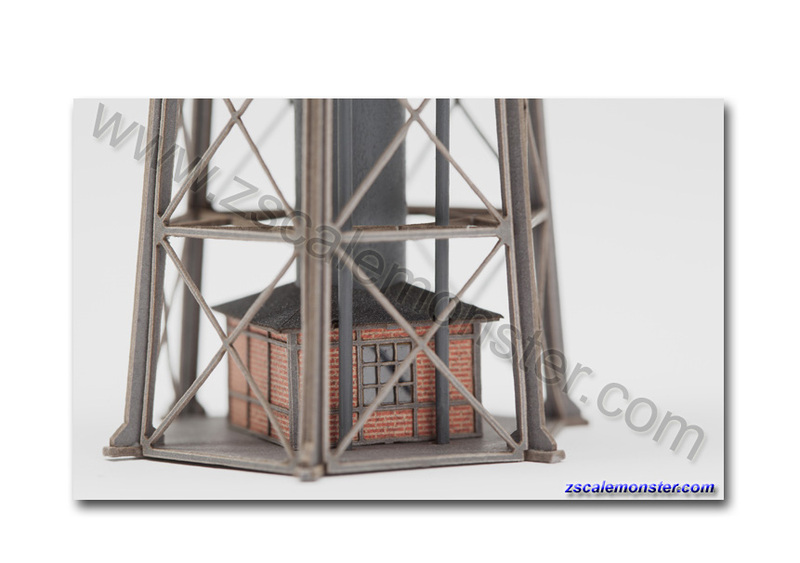 Plenty of details to make for a lively effect with the Signal Tower "Kallental" Kit. 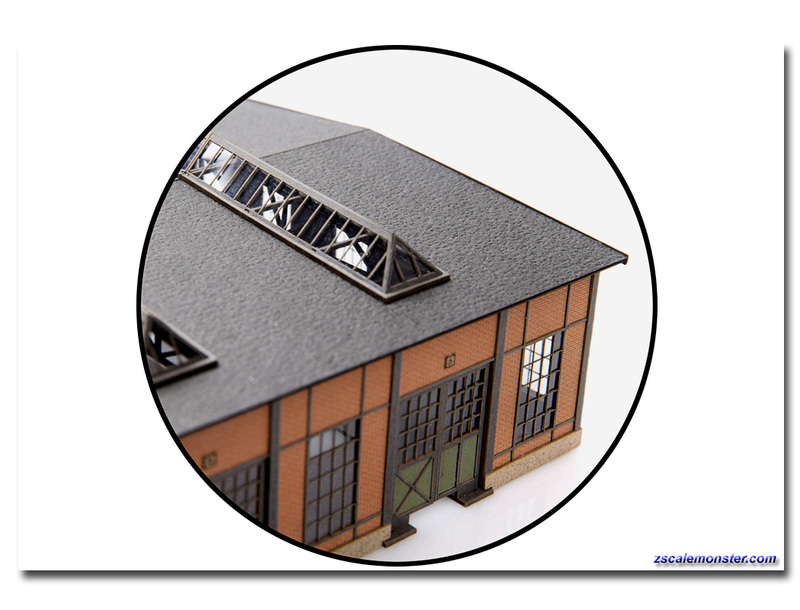 Detail kit to make your Rokuhan turntable look less toy-like. 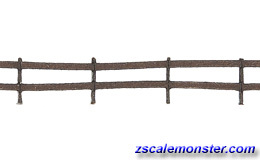 Use the detals around the turntable where the track sections pass through, with a wood tie look, to cover the large unsightly philips screws. 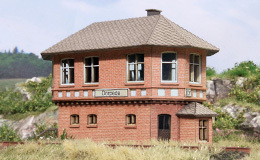 A detailed operator control booth. 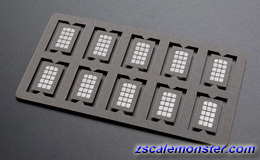 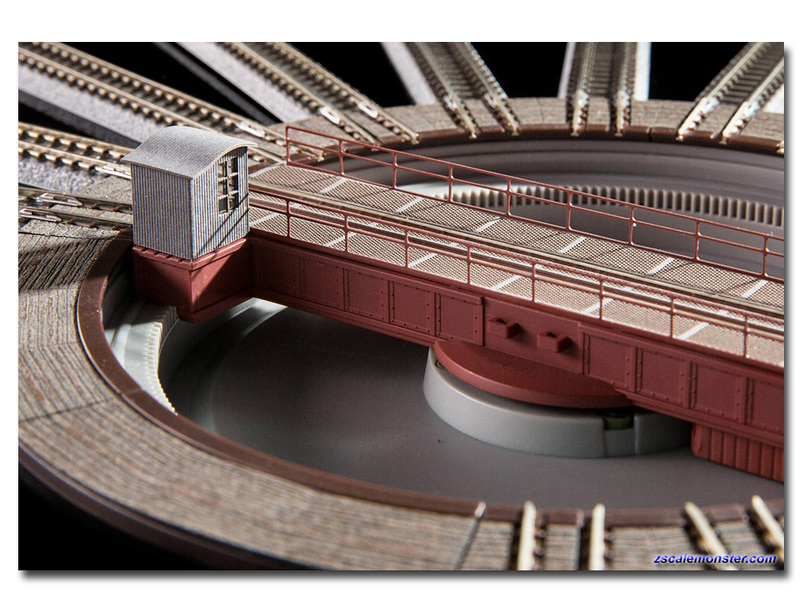 It also includes inserts to cover the top deck of the turntable bridge along and between the track sections. 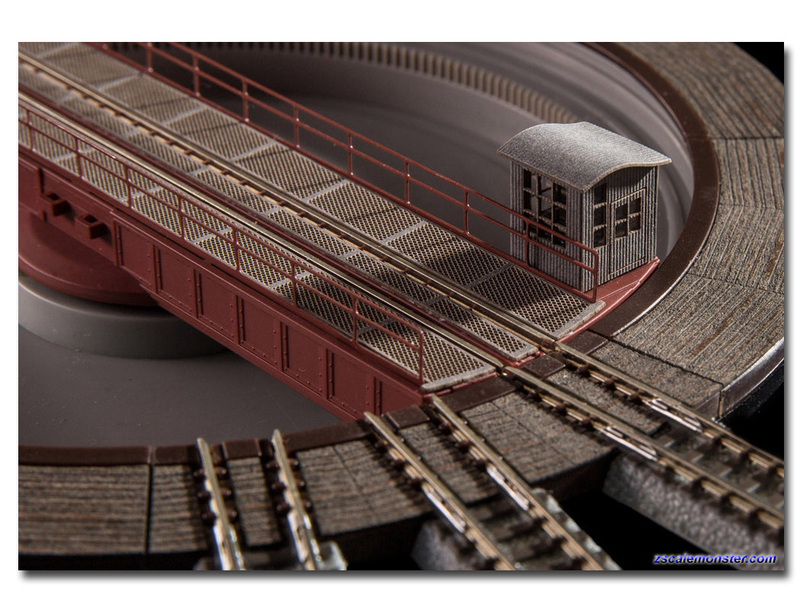 • Turntable and track not included. 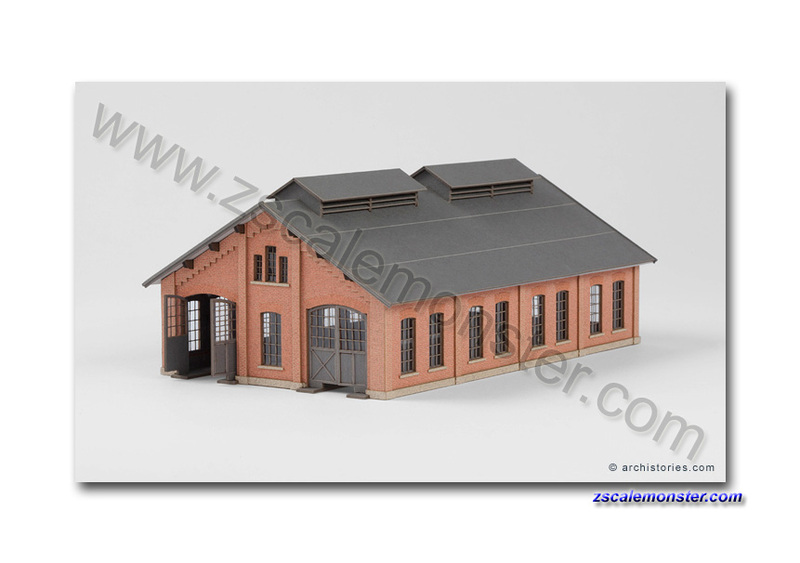 • Repair Shed "Depot Torrnstein"
This two stall repair shed 'Bw Torrnstein' shows a number of features that are typical of Prussian railway architecture, complementing in a most harmonious way the other buildings of this series. 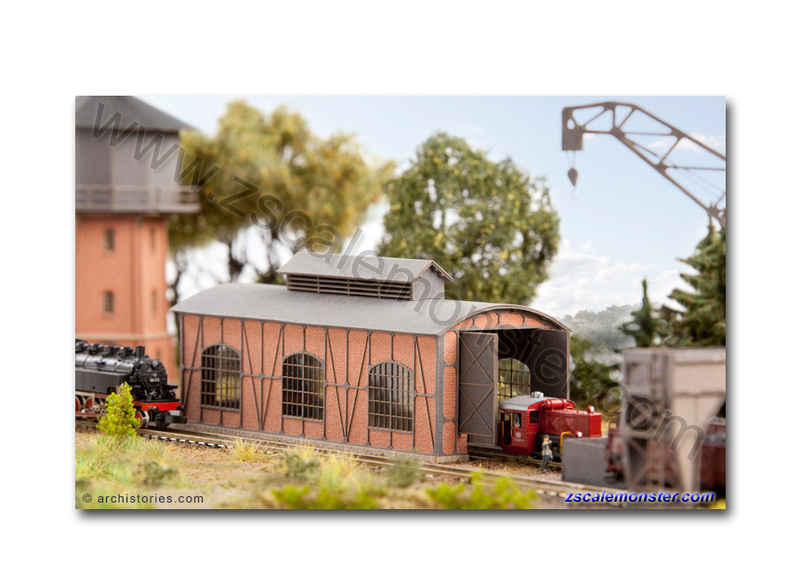 • A number of extremely delicate segmental arch windows, hinge-mounted gates and fine roof structure make the repair shed 'Bw Torrnstein' the climax point of each depot. 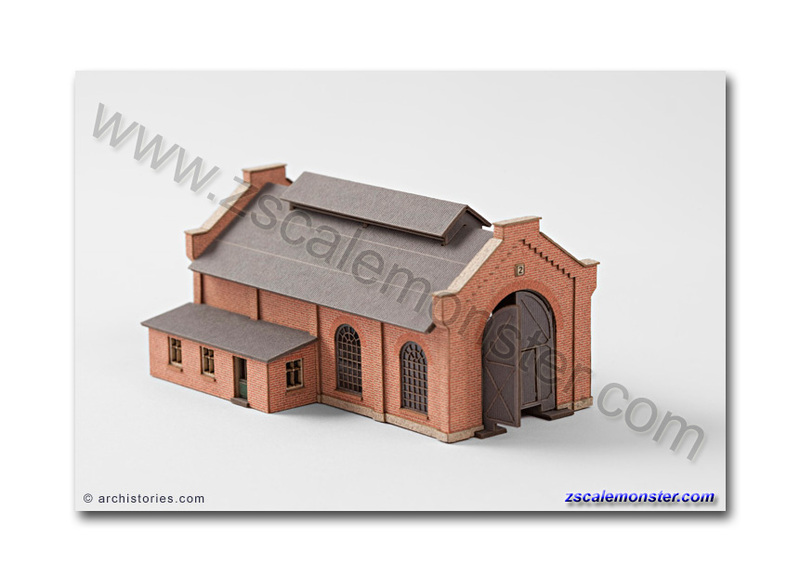 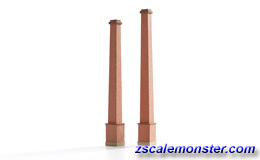 Also known as the engine house, distance between track centers 50mm. 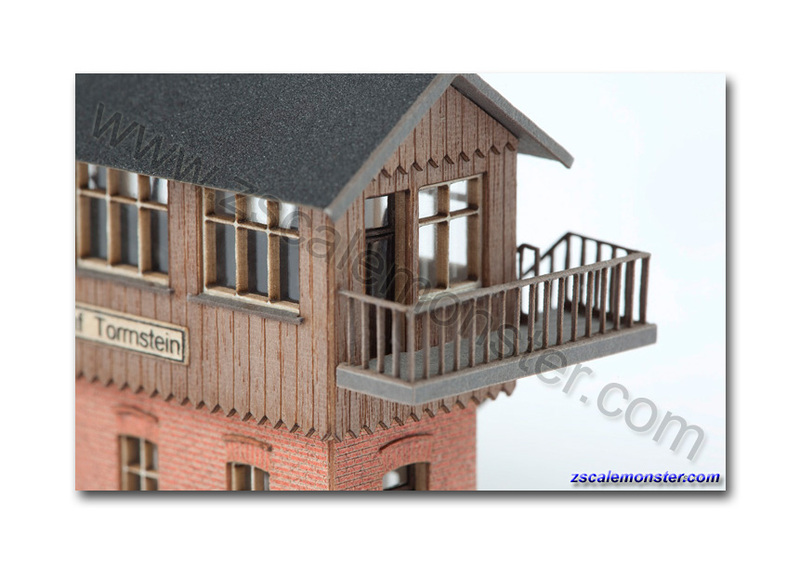 The interlocking tower 'Torrnstein', with its space-saving design, fits well with the cramped conditions between tracks. 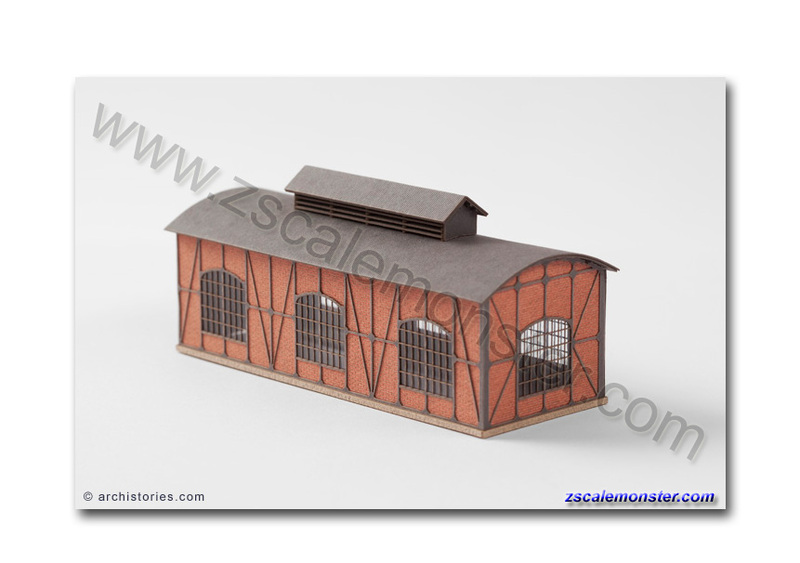 Above the substructure of brick rises the fully glazed wooden construction, the lever Bank. 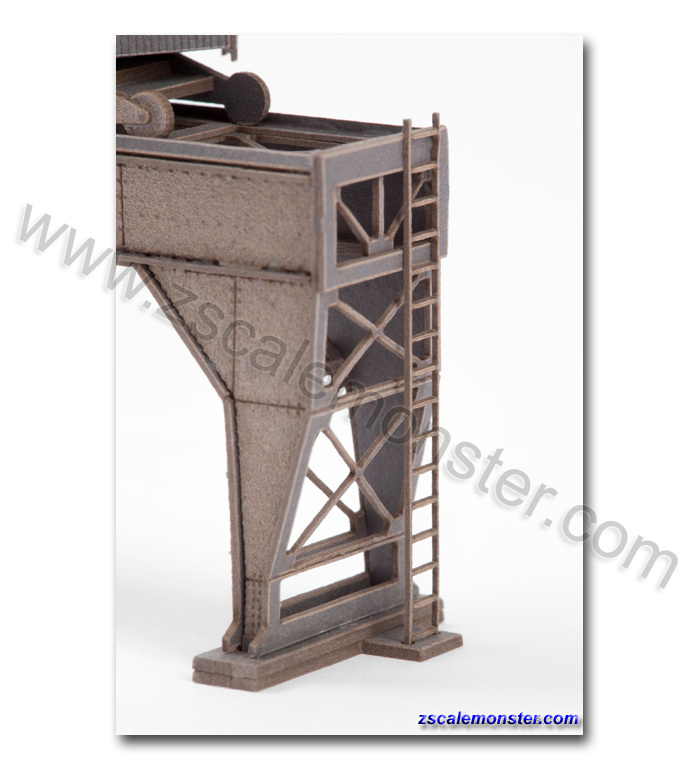 • The upper floor is accessed via a lightweight filigree steel stair case and can be illuminated from above. 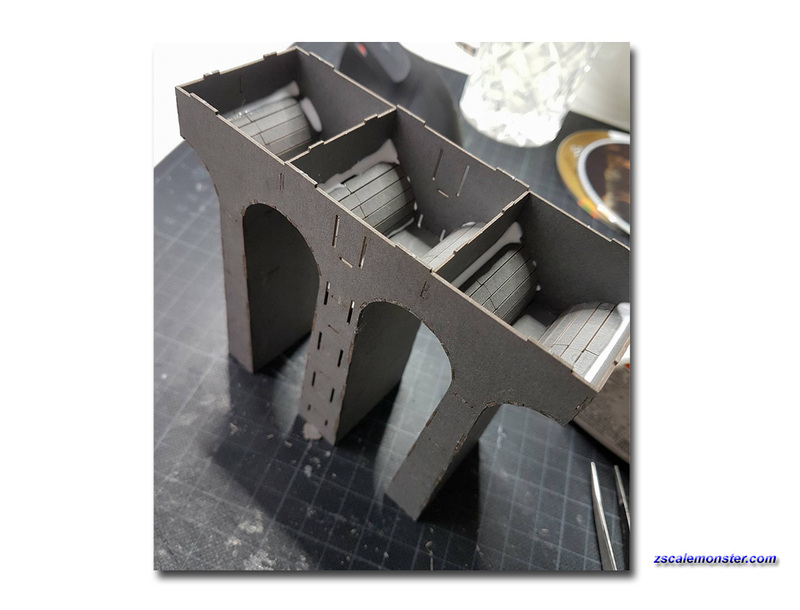 Plenty of details to make for a lively effect with the interlocking tower "Torrnstein". 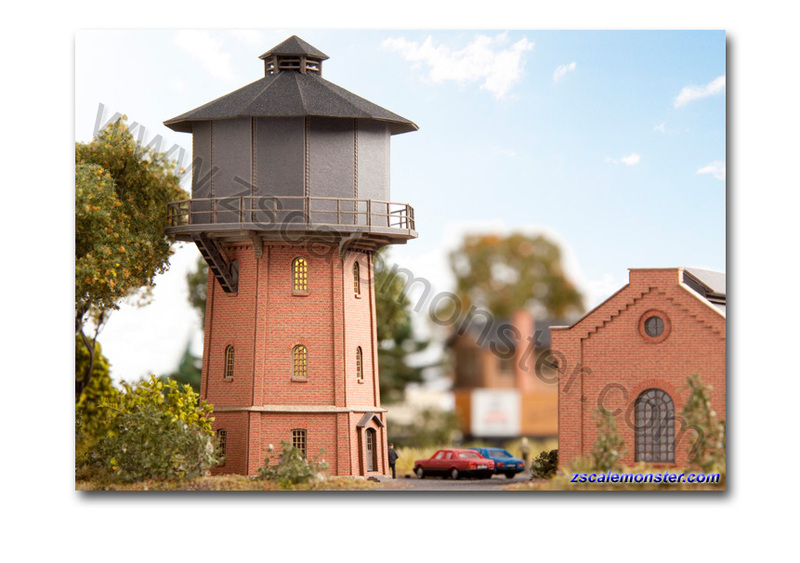 • Water Tower "Bw Torrnstein"
The water tower 'Bw Torrnstein' can be added harmoniously with the other very striking Prussian railway buildings such as an Engine House, Interlocking Tower, Gantry Crane, Railway Workers House and more. 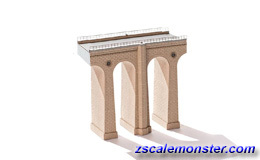 • A distinctive steel water tank with circulating catwalk and ventilation structure rests on a two-story base with arched windows and fine sandstone elements. 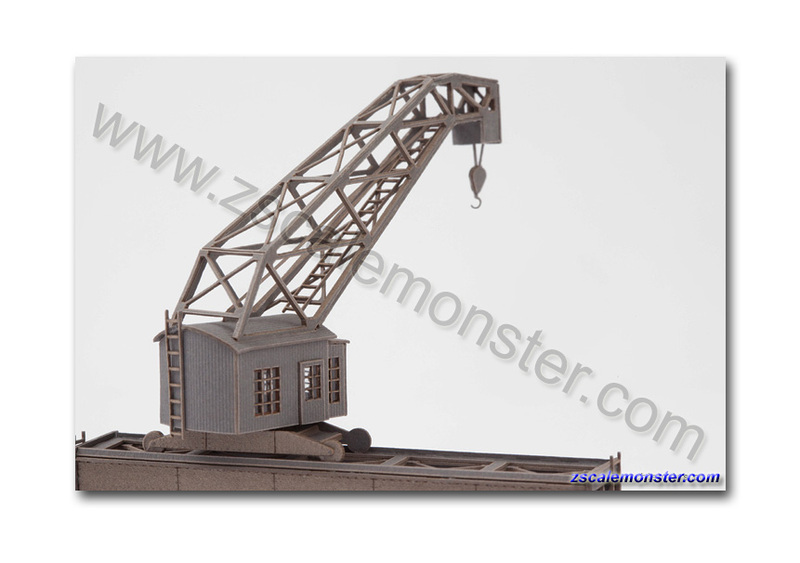 • Gantry Crane "AW Lingen"
Located within depots, on the main and branch lines or as a port facility, the extremely delicate filigree gantry crane along the lines of 'Lingen' offers a creative high point on each diorama. 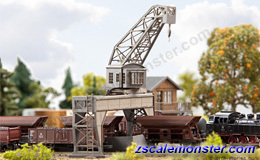 The crane can be arranged in multiple positions by rotating and sliding cab with its effective crane boom fascinating imaginations. 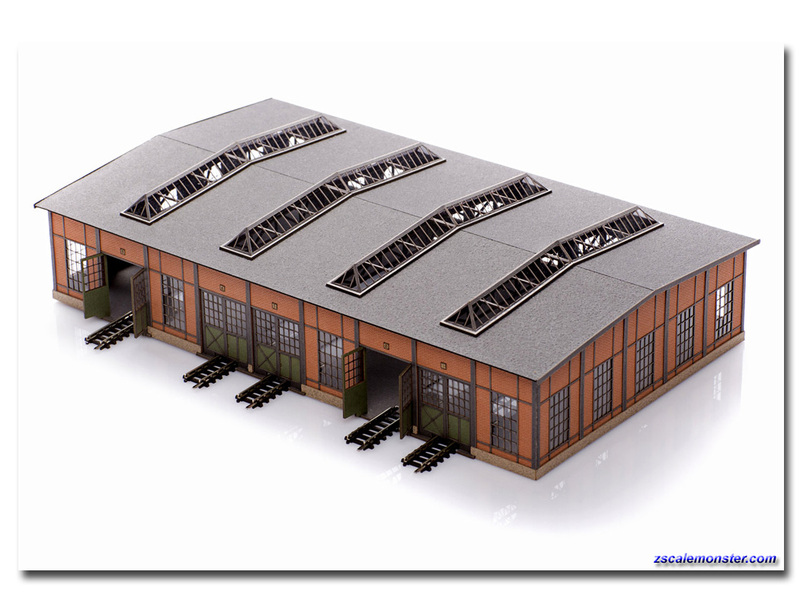 Supplied with bins. 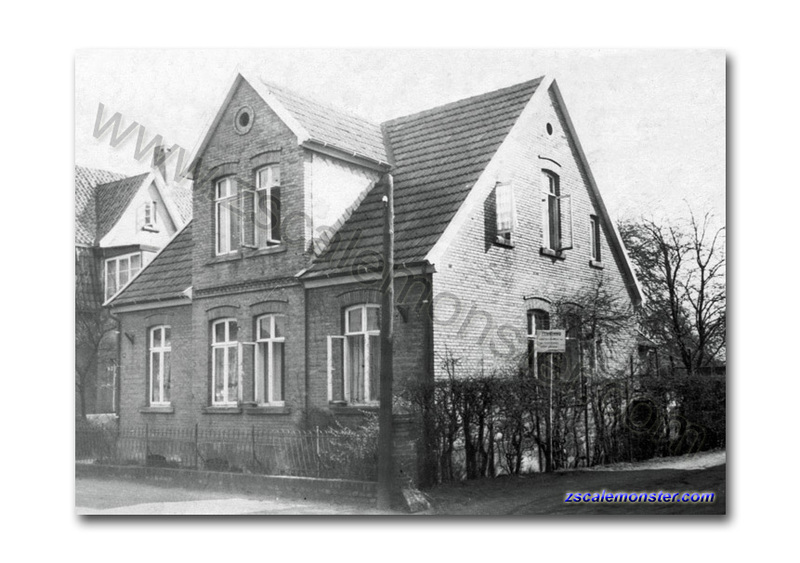 A particularly Prussian influenced style and facade with large-scale brick masonry. 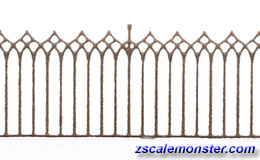 Large windows with a subtle arch motif surround. 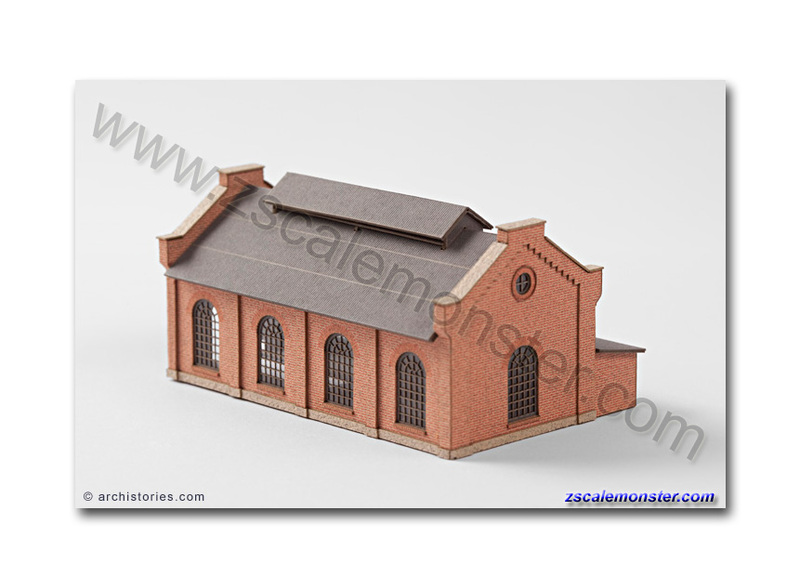 The building is also well suited as a local court, post office or other large important structure by using without the platform. 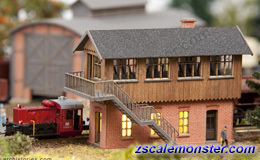 This station is not only great for German dioramas but also Eastern Europe, Swiss and Austrian dioramas. 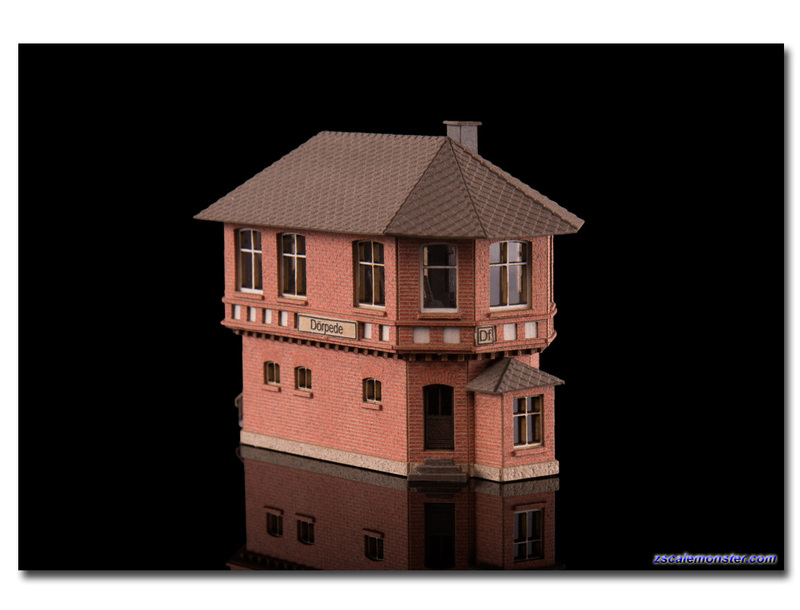 • Representative of the large footprint train station building 'Torrnstein'. 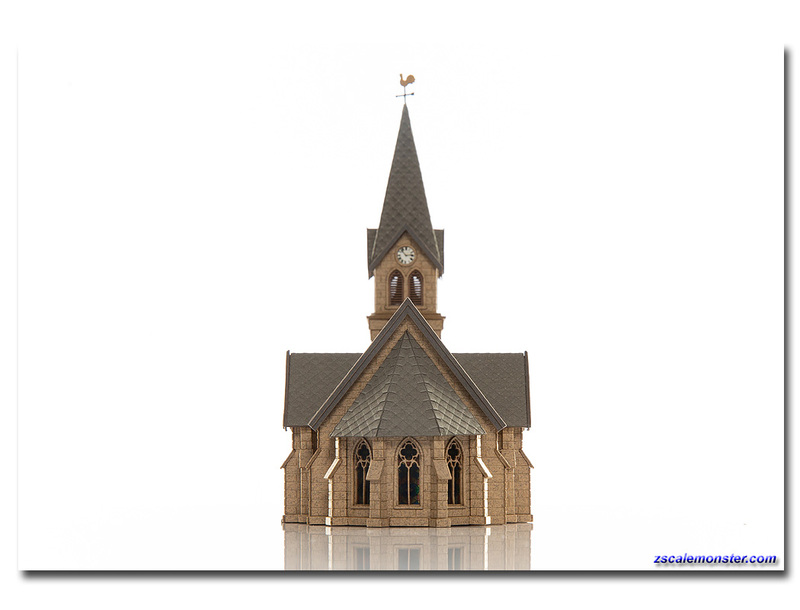 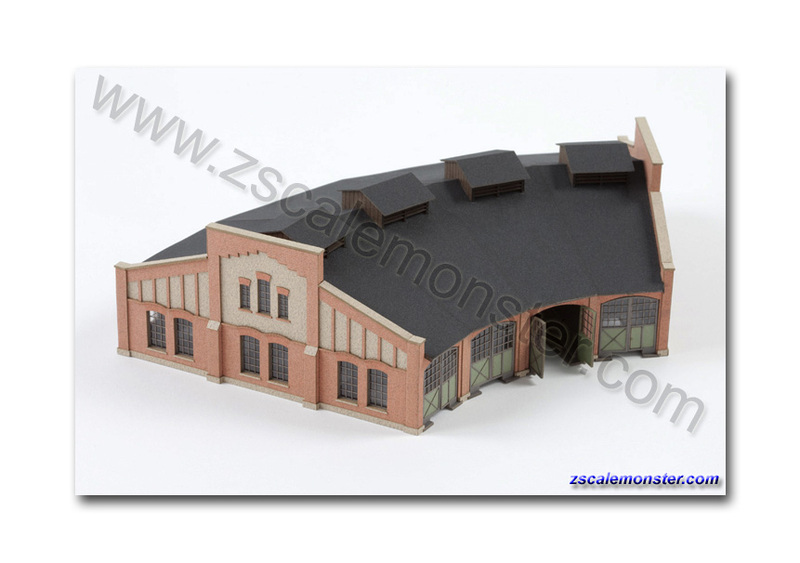 Packed with detail from the gabled arrangement of three building sections, an elevated two story central portion and a station clock in the main gable typical of the style. 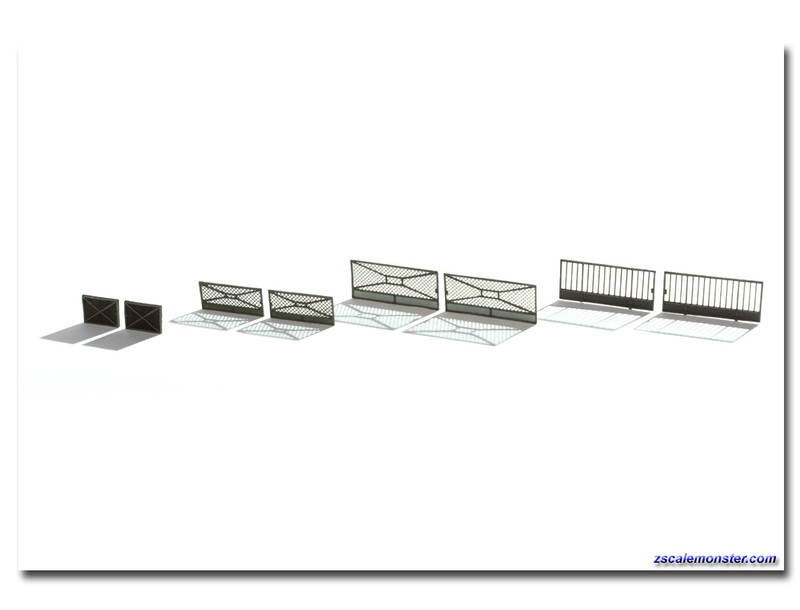 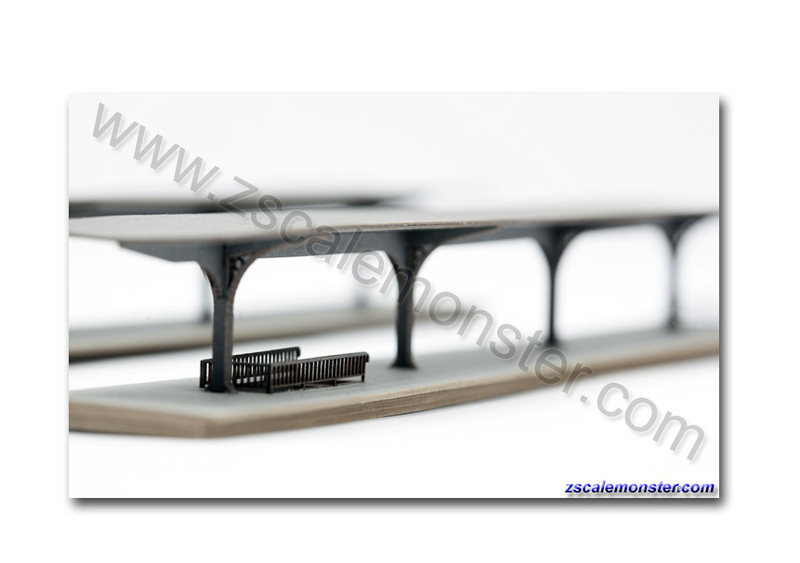 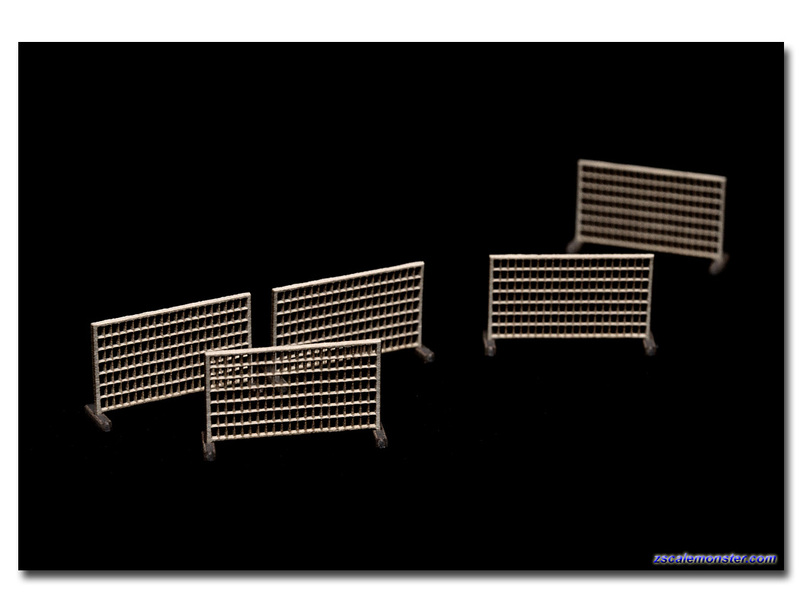 Platform set with railing elements for easy expansion of the products: Station 'Torrnstein' (Art. 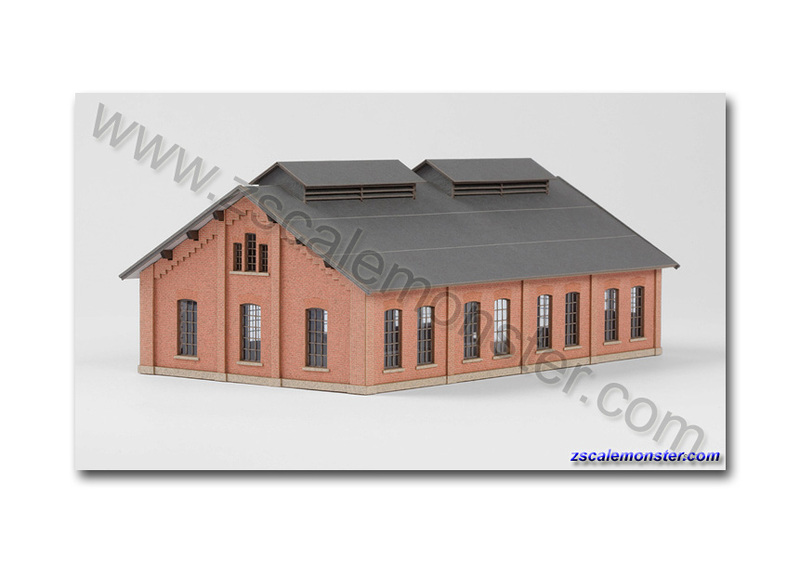 108131) and Station 'Wolkenstein' (Art. 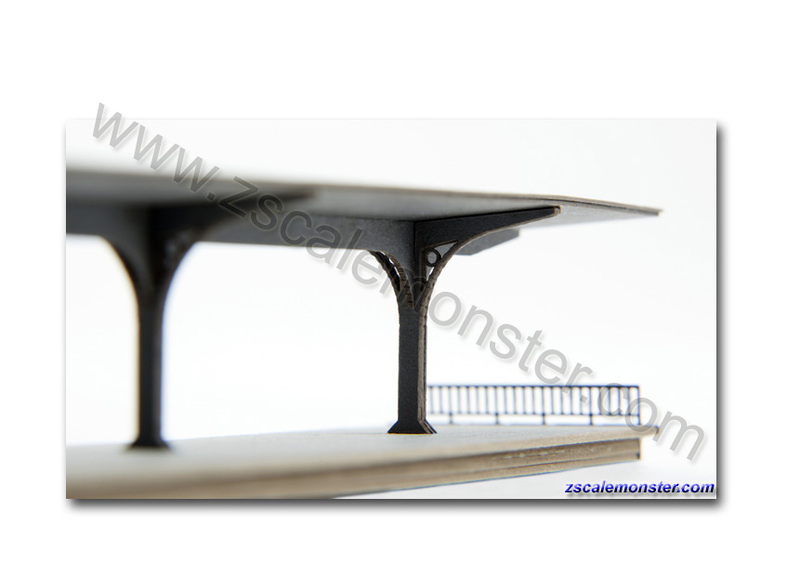 116131), consisting of an extension of the platform and two central platforms with canopies on a solid support structure. 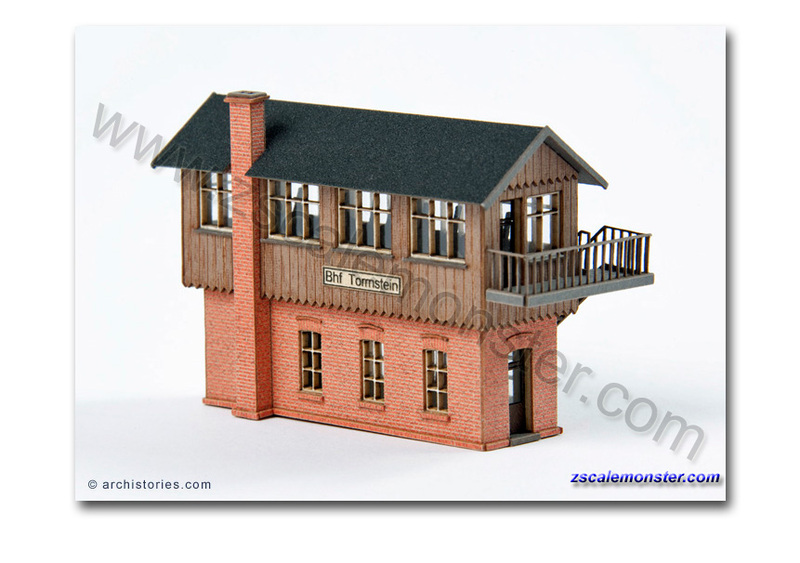 • One of the central platforms has a staircase. 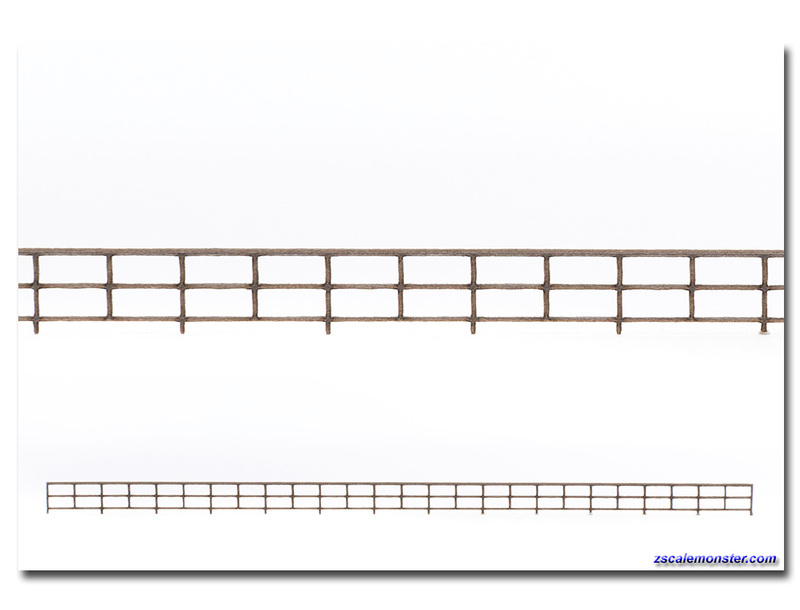 To attach LED lighting, cables can be run and hidden in the Holhr�umen roof racks. 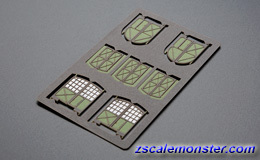 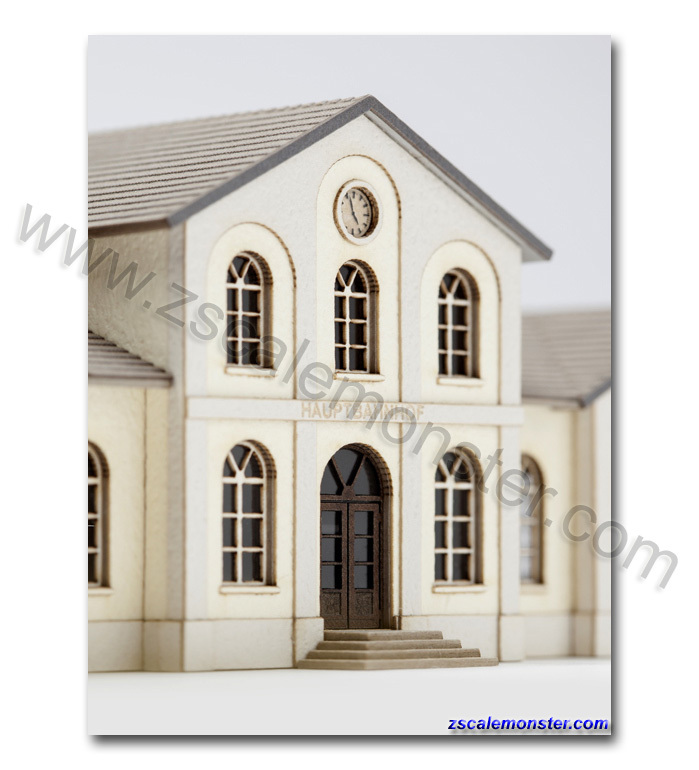 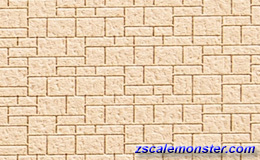 A kit particularly suitable for dioramas of South German facade design with color replicating slightly varying plaster surfaces. 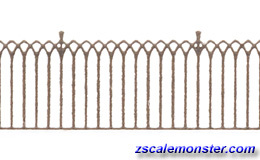 Large windows with a subtle arch motif surround. 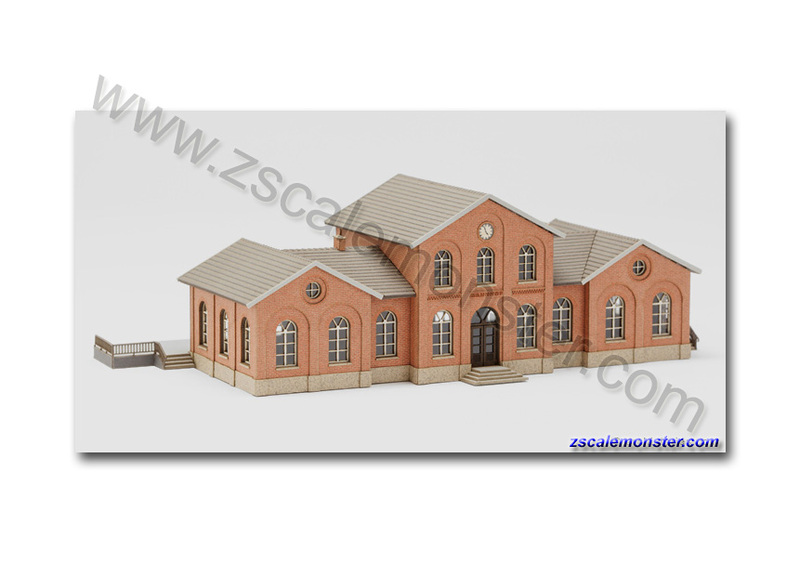 The building is also well suited as a local court, post office or other large important structure by using without the platform. 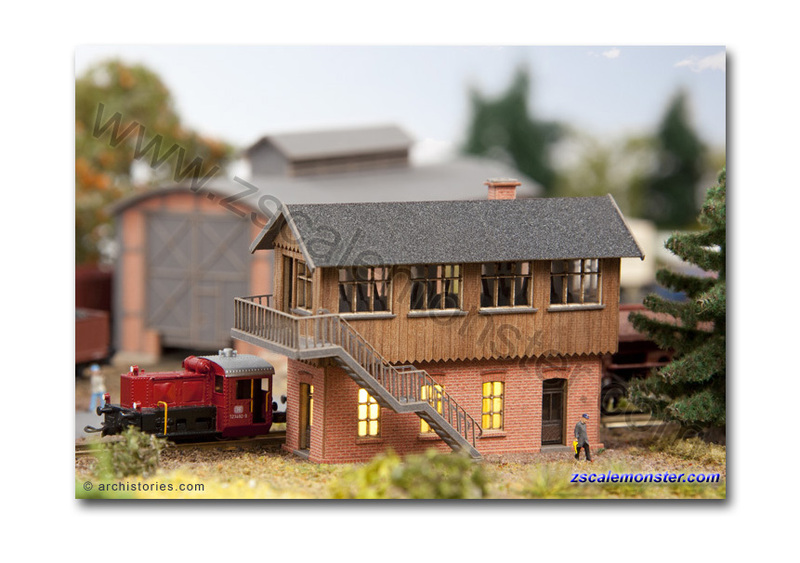 This station is not only great for German dioramas but also Eastern Europe, Swiss and Austrian dioramas. 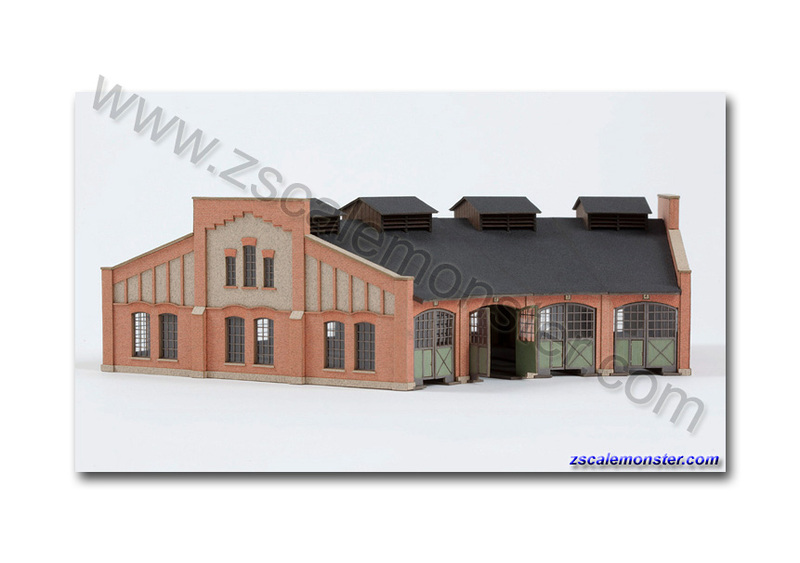 • Representative of the large footprint train station building 'Selva'. 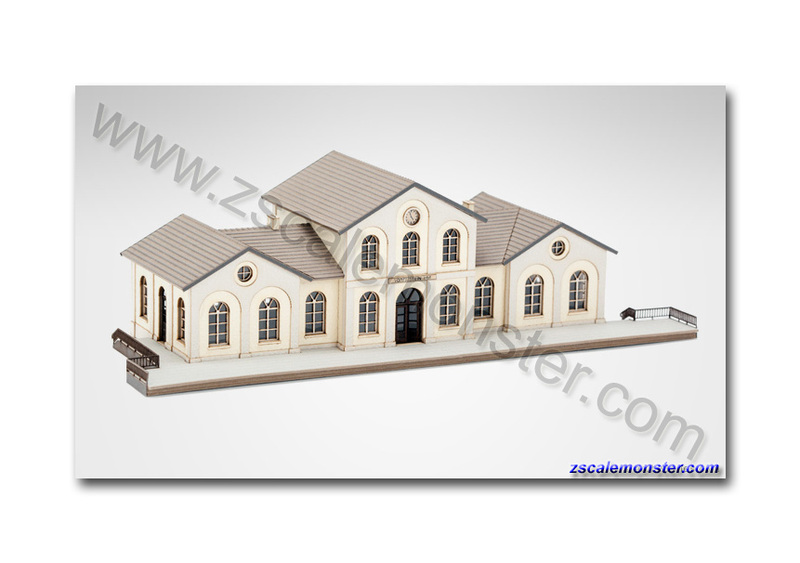 Packed with detail from the gabled arrangement of three building sections, an elevated two story central portion and a station clock in the main gable typical of the style. 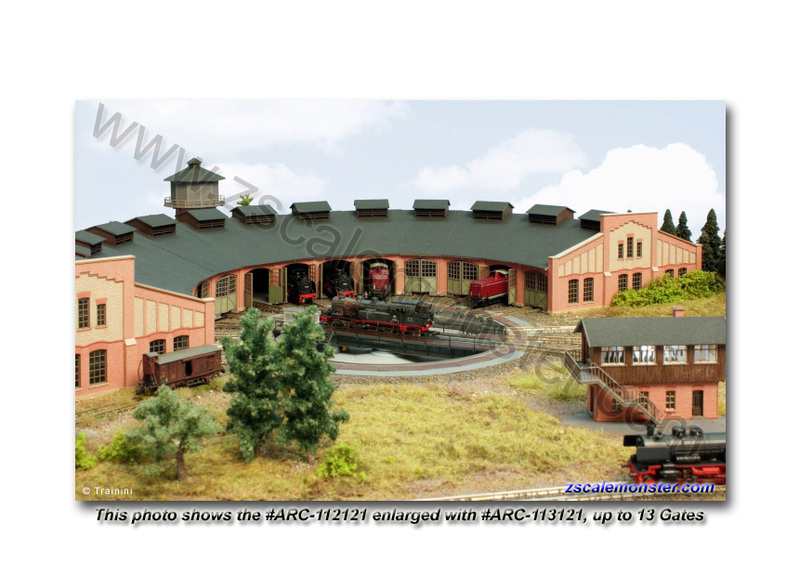 The Roundhouse can be extended to any number of stalls by purchasing #ARC-113121 (below) with two individual add-on stalls per kit. 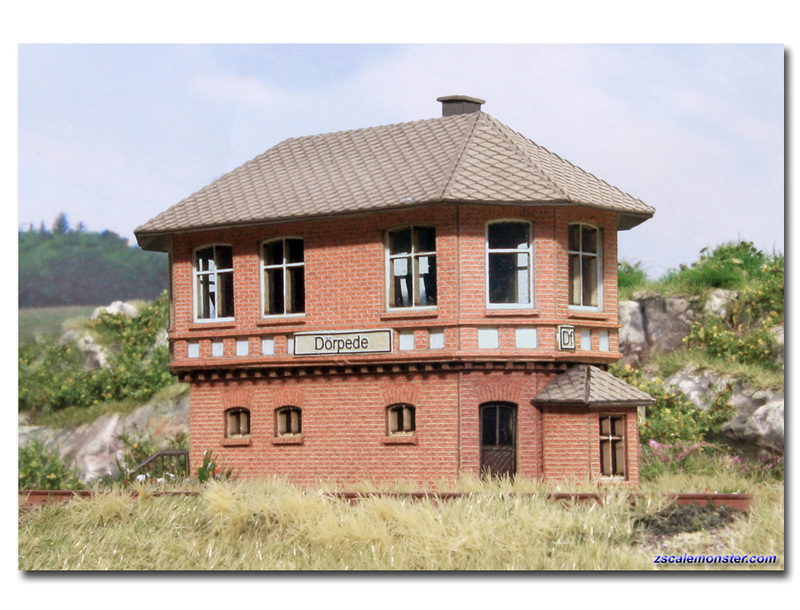 An exceptionally elaborate facade design with impressive entrance gates, fine window bars and many charming details designed into the popular 'Bw Torrnstein' roundhouse. 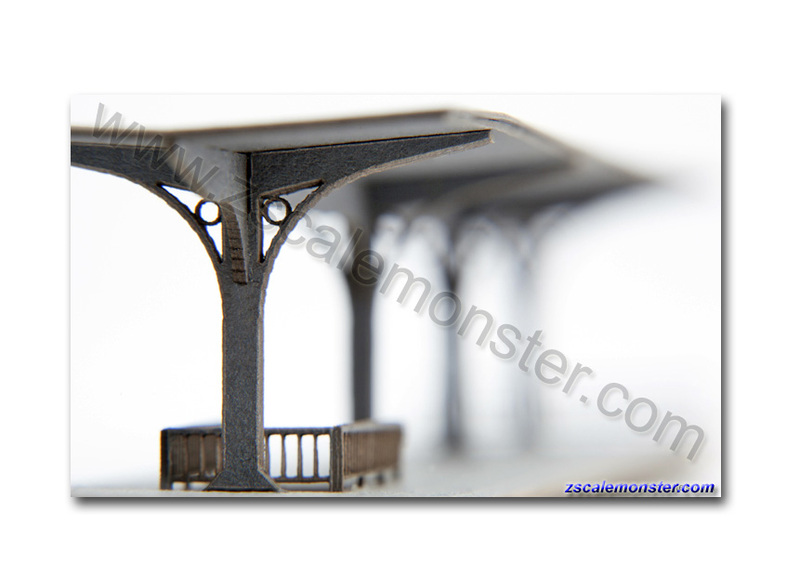 For a fascinating focal point, add this structure to your layout. 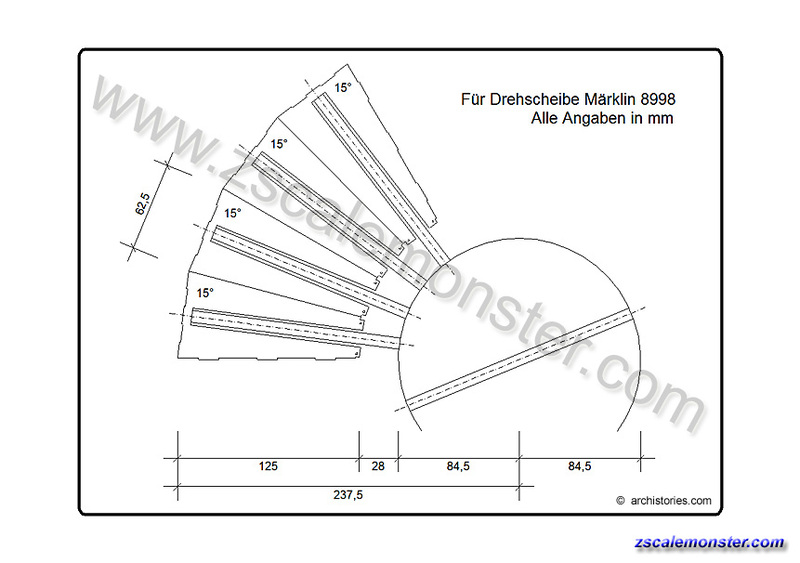 Please refer to the dimensioned drawing in the product gallery. 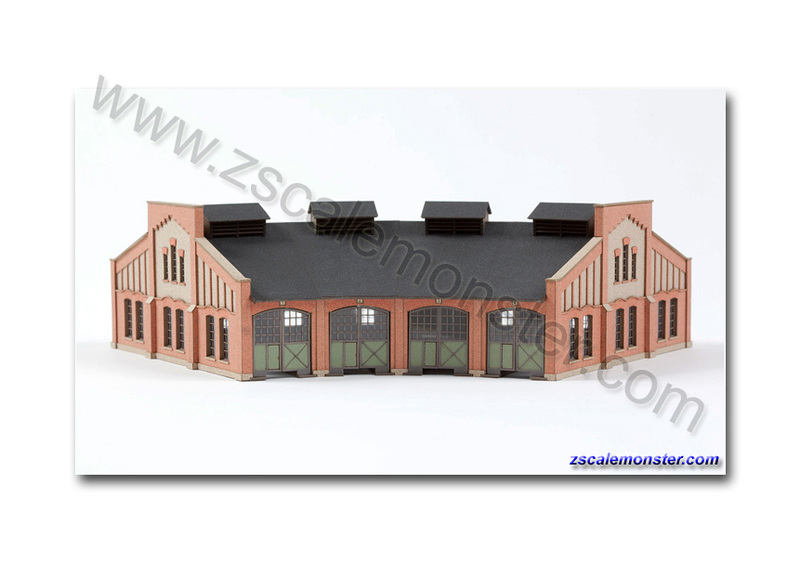 Another structure with the typical characteristics of Prussian style industrial architecture from the late 19th century. 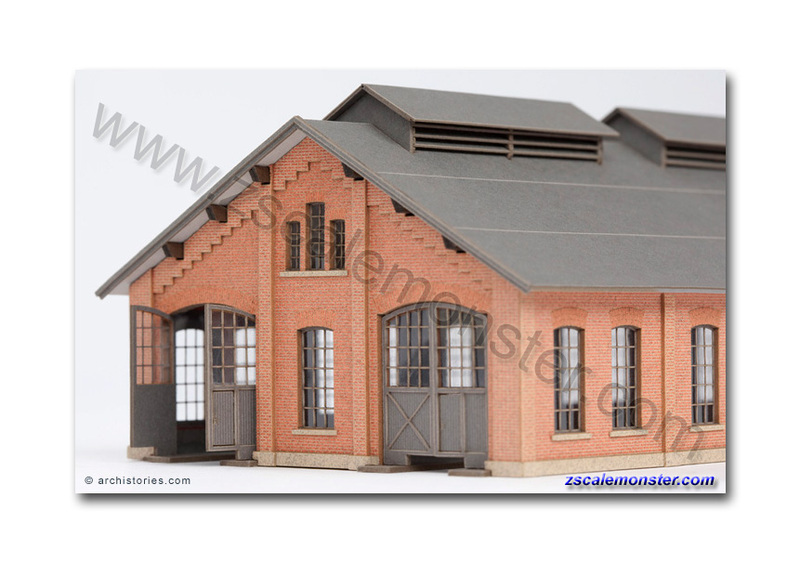 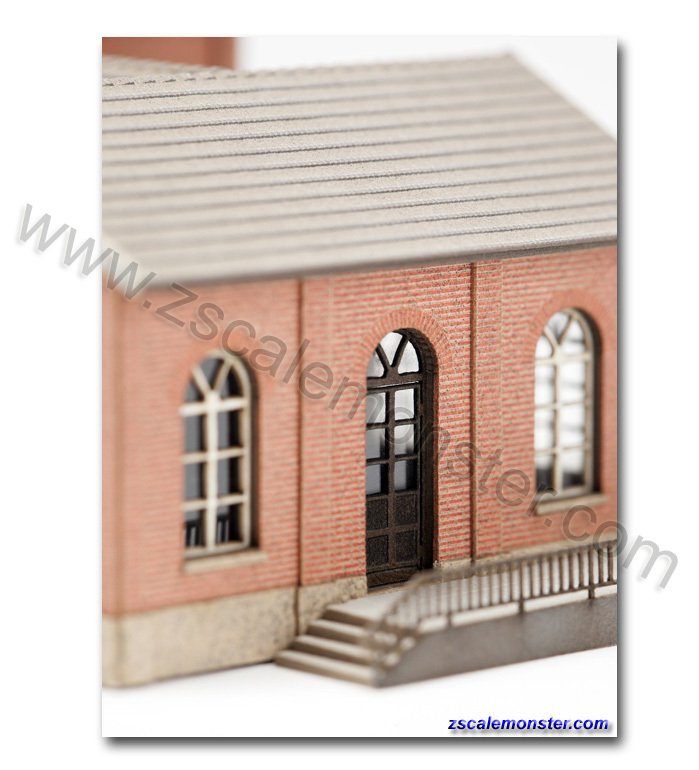 This locomotive shed is adorn by details such as horizontal gable statements and brick friezes. 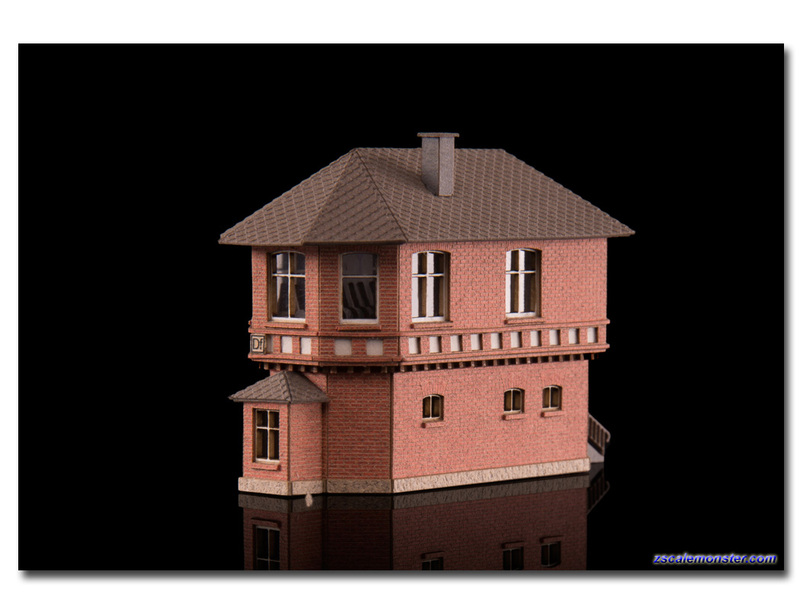 Add this kit to your complex of other Archistories structures sold on this page. 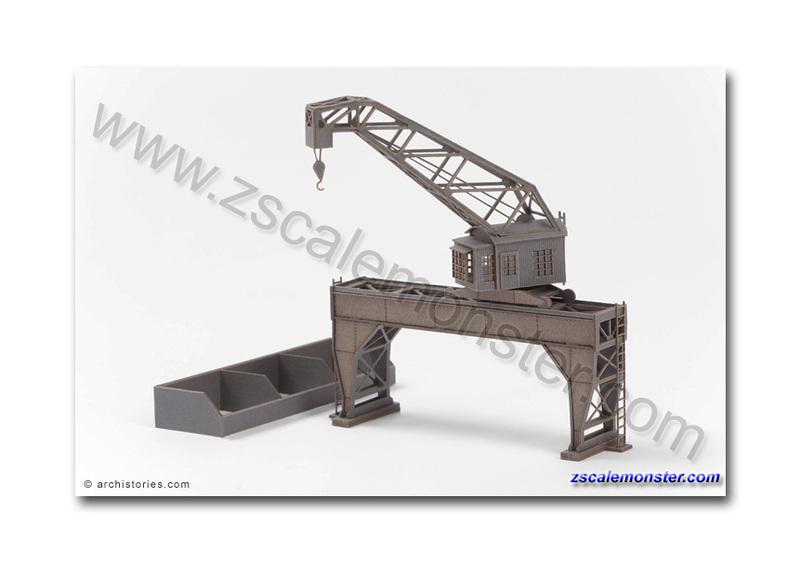 • Locomotive maximum width of up to 17mm. 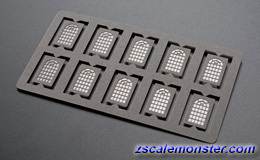 • A very delicate lattice making up the panes of the arched windows, a hinge-mounted entrance gate and truss interior of the building provide fascinating details in the highest precision. 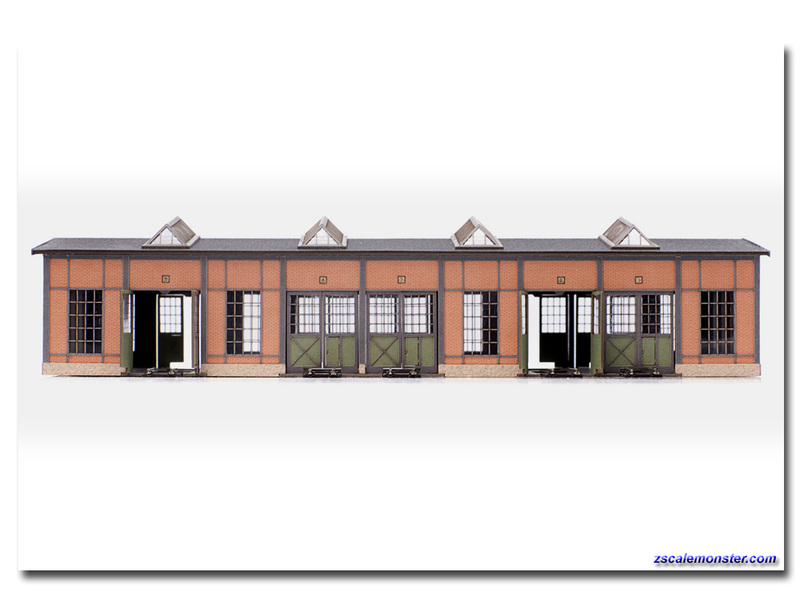 Located on the side of the locomotive shed is a single story office space. 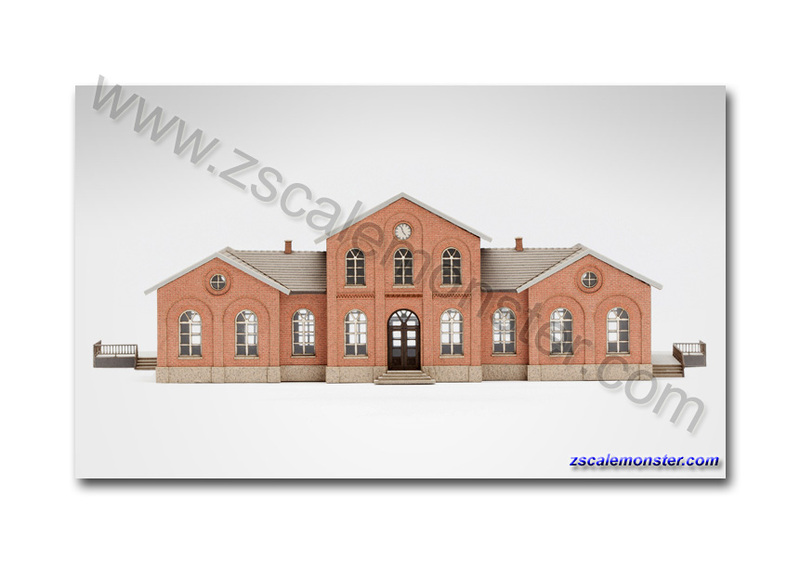 Here we have a turn of the century structure, quite frequently encountered in northern and central Germany, constructed of typical red brick architecture. 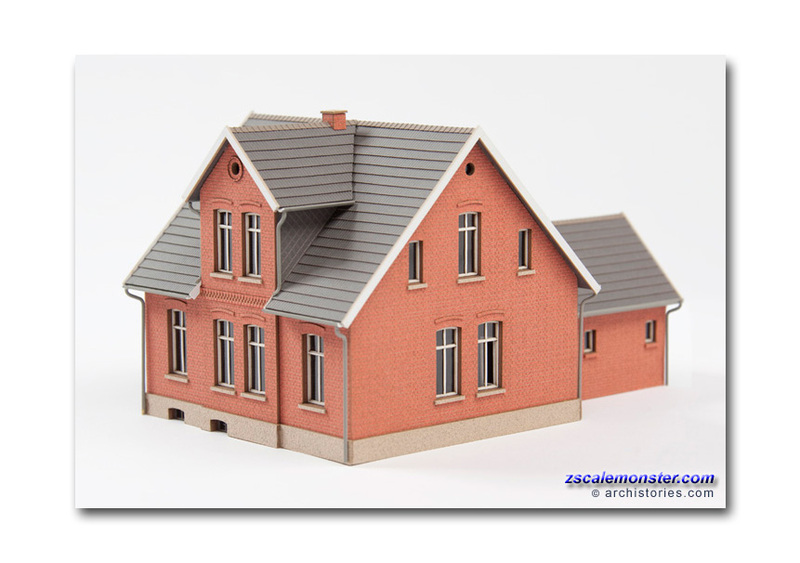 Also known as a captain's house, this term goes back to the protruding upper center portion of the brick structure revealed through the roofline. 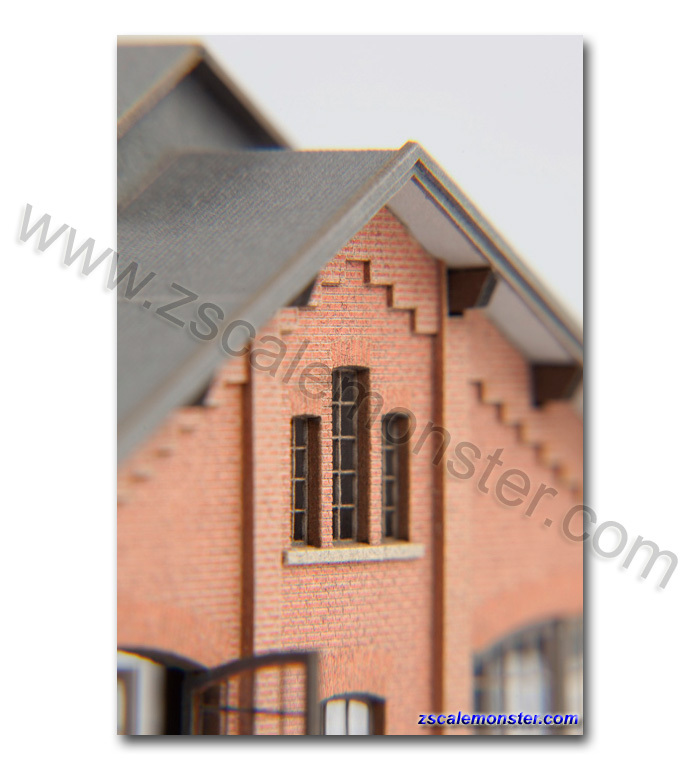 • This product can be used multiple times, varied by swapping the gable walls. 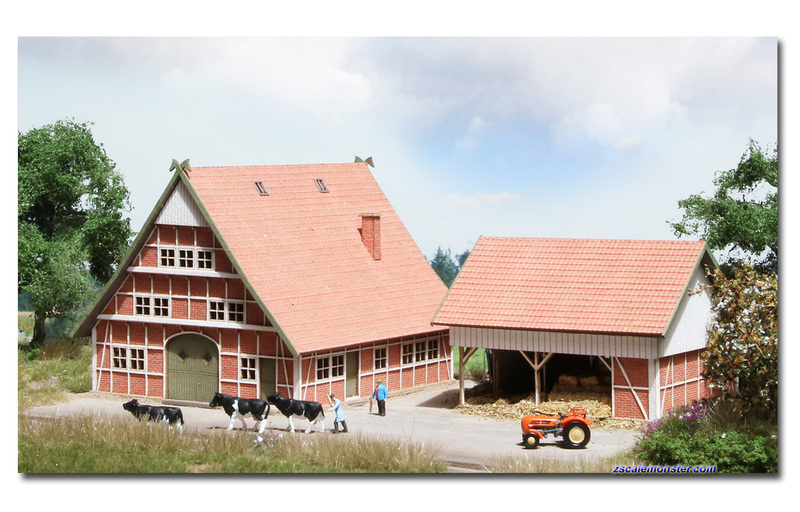 • The prototype of the kit was built circa 1894 in Emsland Lingen and exists to this day. 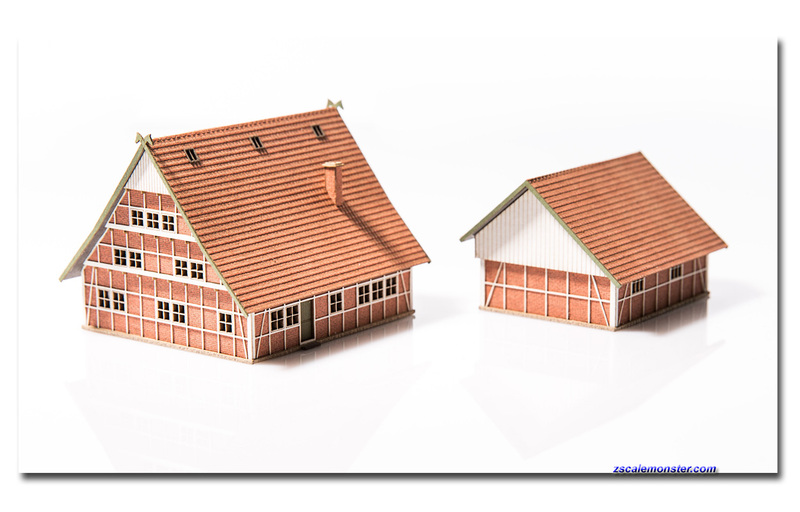 In the back yard could be found pigs or chickens for self-sufficiency of residents. 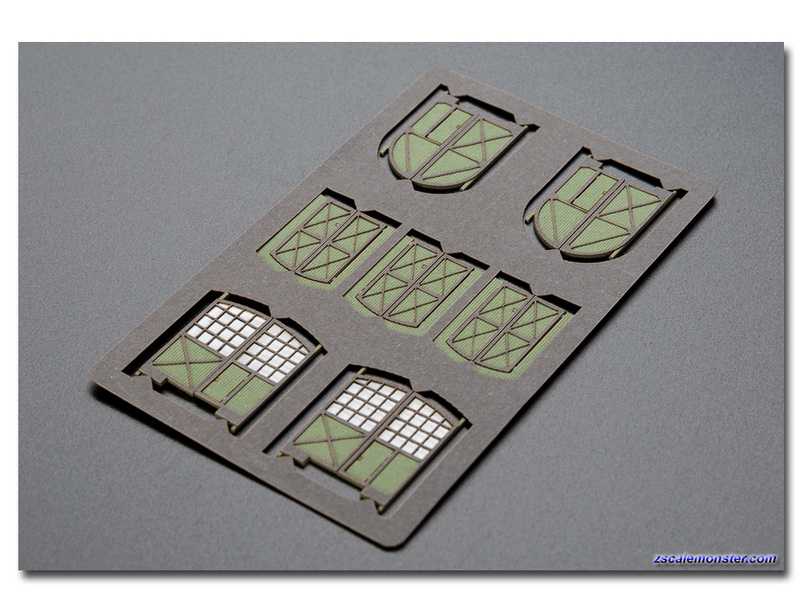 This kit is available in four colors (403, 404, 408, 409). 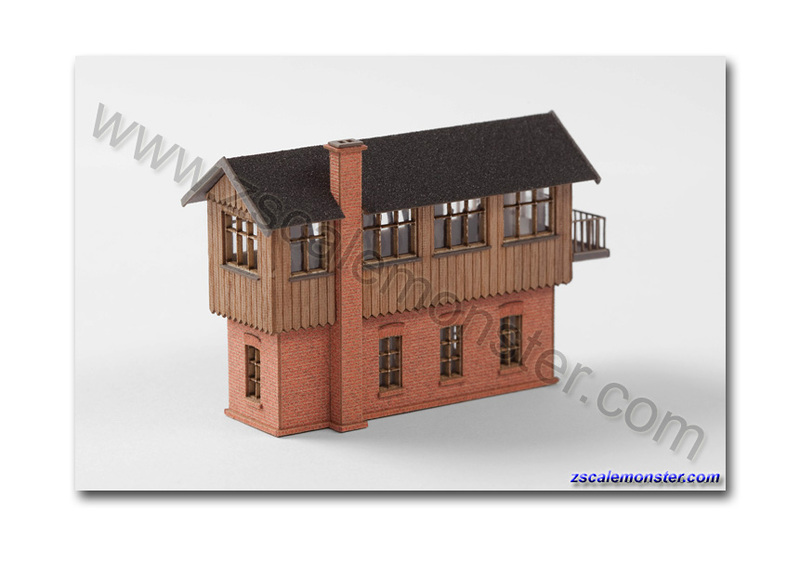 The house 'Svensson' shows typical features of a traditional wooden house, inspired by 16th century Swedish architecture. 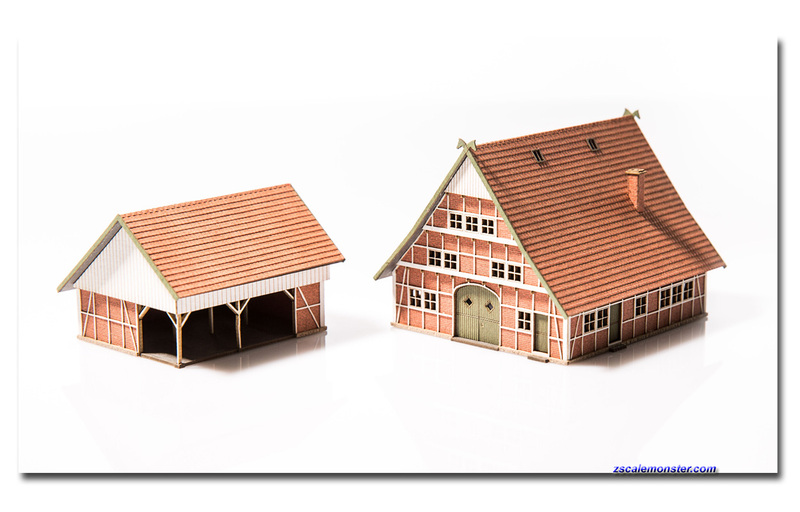 While the wood paneling received the falun red color, building edges, window frames, shutters and railings were accented with white paint. 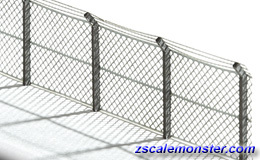 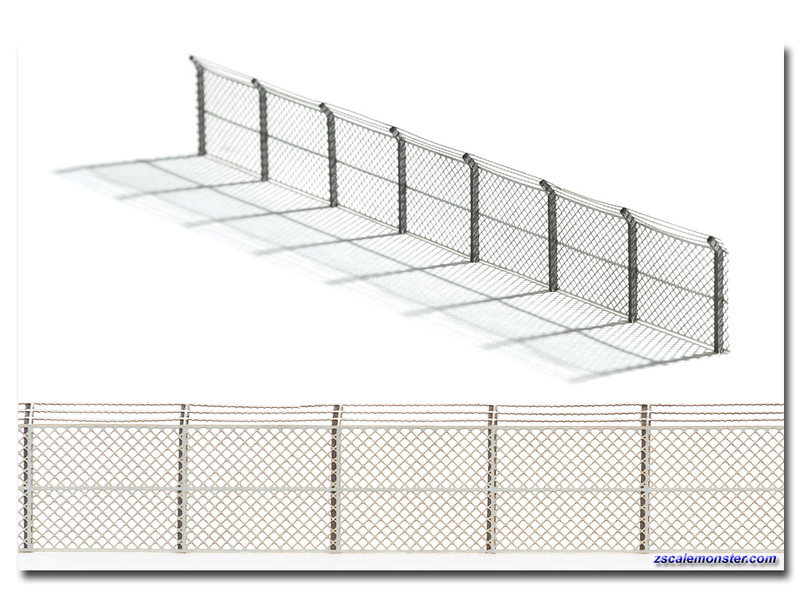 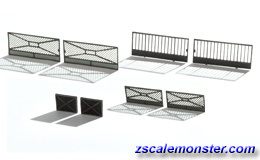 • This product can be used multiple times, varied by swapping the roof surfaces. 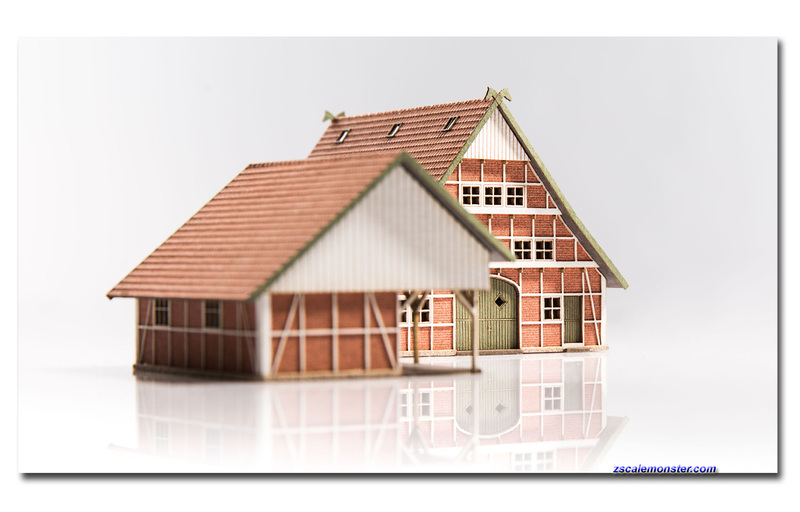 • In contrast to the rather spartan historical models, the 'Svensson' has white painted shutters and an attractive yet effective entrance roof (a romanticized detail with the model) as it is to be found in Germany, frequently today. 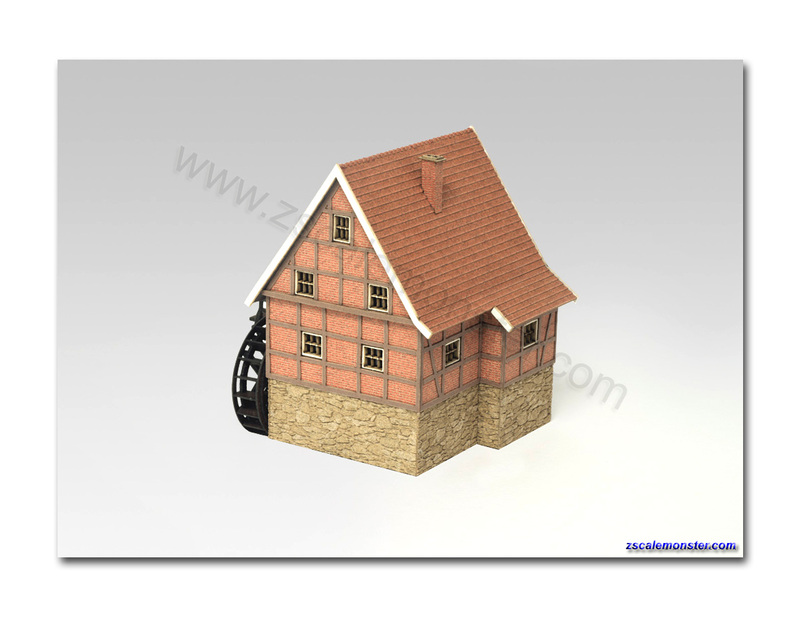 The house 'Johansson' shows typical features of a traditional wooden house, inspired by 16th century Swedish architecture. While the wood paneling received the understated and elegant-looking dark green color, building edges, window frames, shutters and railings were accented with white paint. 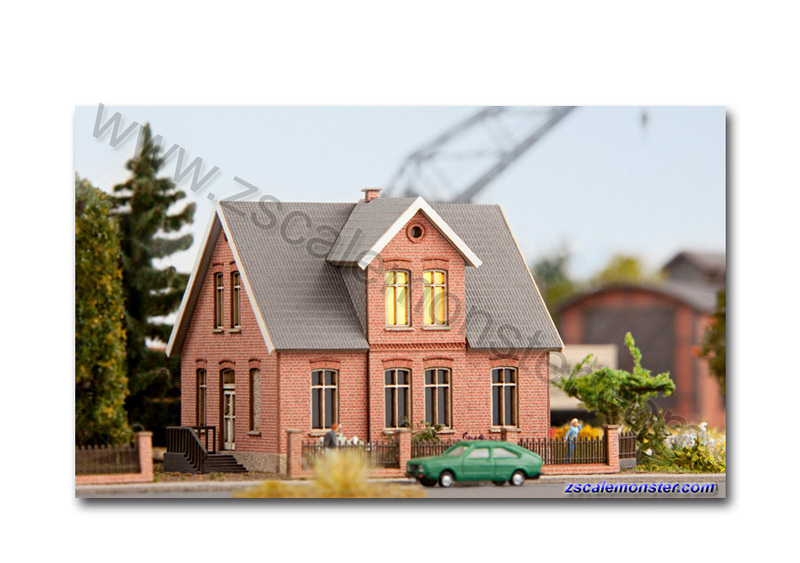 • In contrast to the rather spartan historical models, the 'Johansson' has white painted shutters and an attractive yet effective entrance roof (a romanticized detail with the model) as it is to be found in Germany, frequently today. 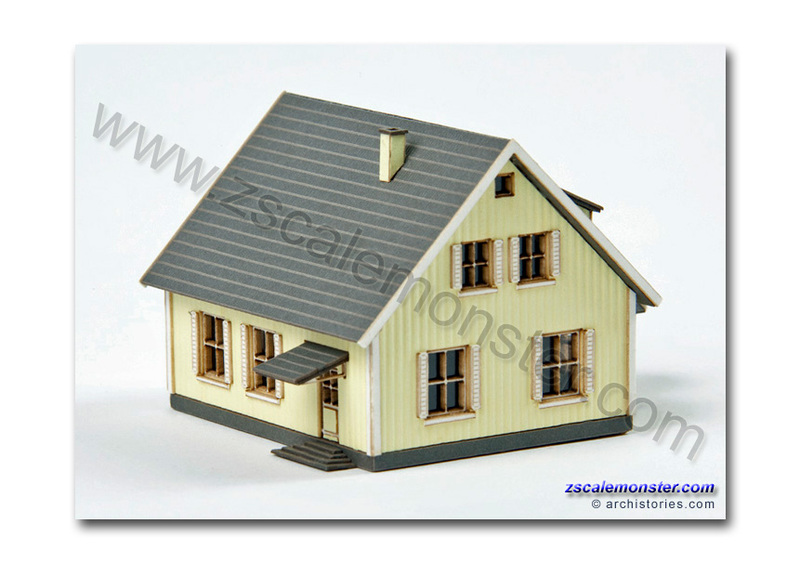 The house 'Karlsson' shows typical features of a traditional wooden house, inspired by 16th century Swedish architecture. 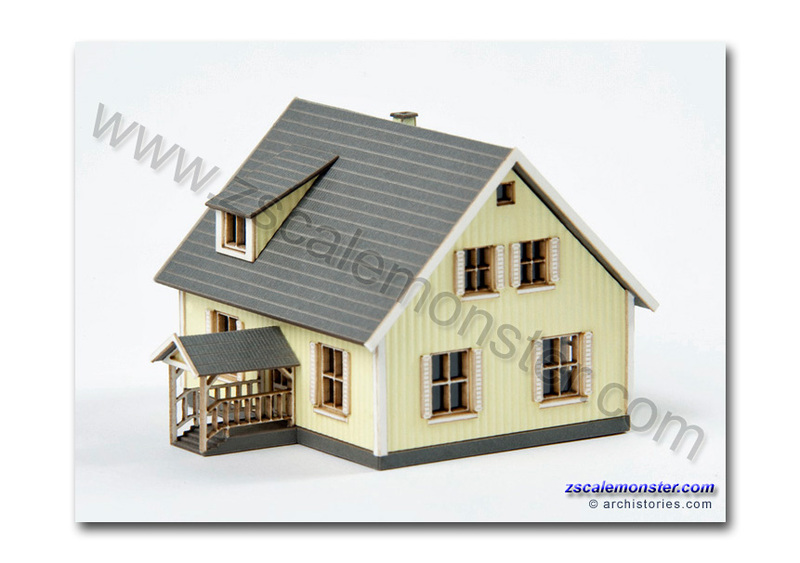 While the wood paneling received the understated and elegant-looking light yellow color, building edges, window frames, shutters and railings were accented with white paint. 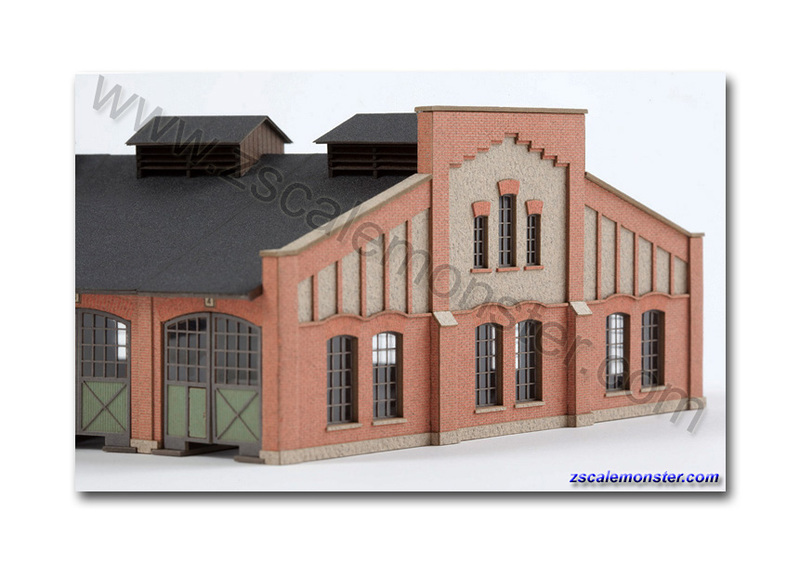 • In contrast to the rather spartan historical models, the 'Karlsson' has white painted shutters and an attractive yet effective entrance roof (a romanticized detail with the model) as it is to be found in Germany, frequently today. 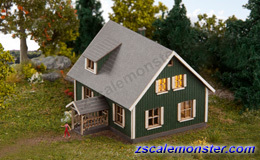 The house 'Hanson' shows typical features of a traditional wooden house, inspired by 16th century Swedish architecture. 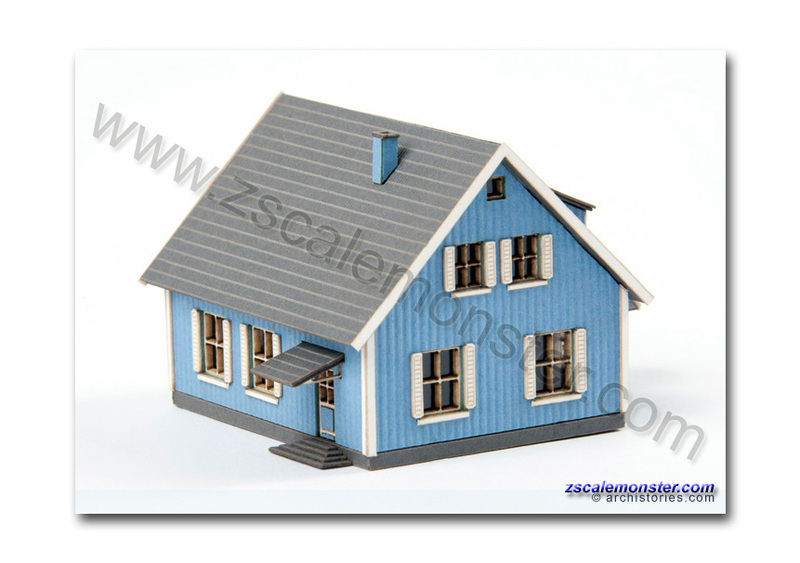 While the wood paneling received the understated and elegant-looking light blue color, building edges, window frames, shutters and railings were accented with white paint. 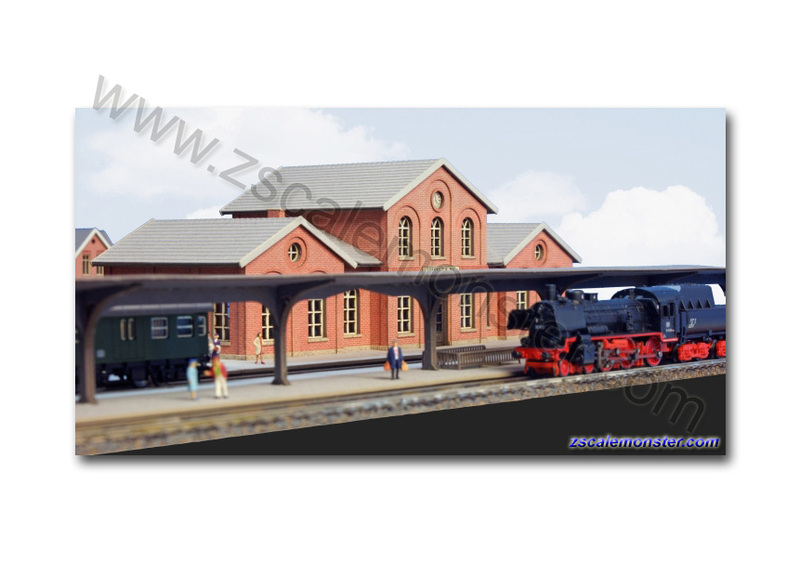 • In contrast to the rather spartan historical models, the 'Hanson' has white painted shutters and an attractive yet effective entrance roof (a romanticized detail with the model) as it is to be found in Germany, frequently today. 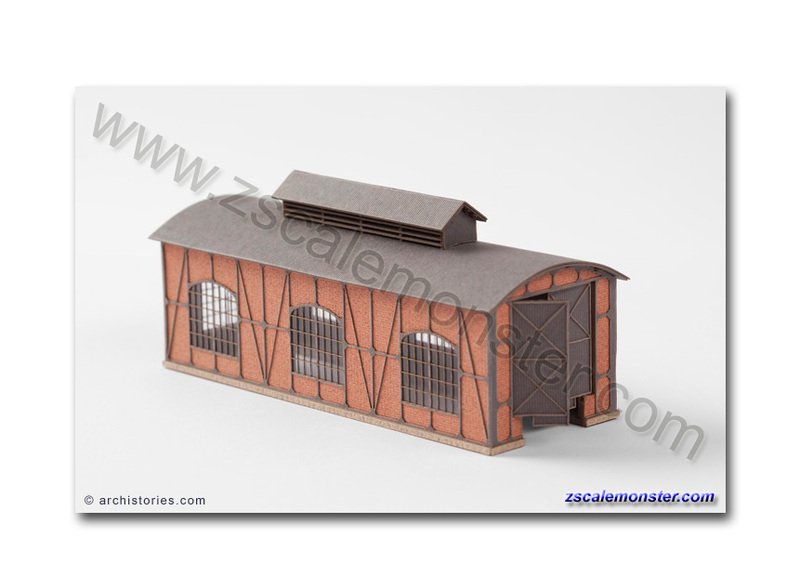 • Transfer Table Shed "Bw Torrnstein"
In keeping with the Miniclub transfer table (art. 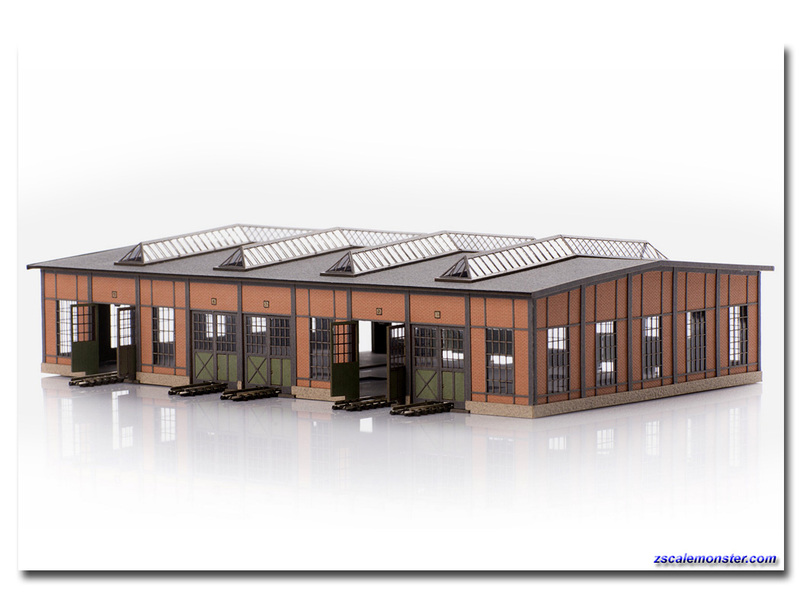 8994) from M�rklin, we have developed a steel framework engine shed of fascinating filigree. 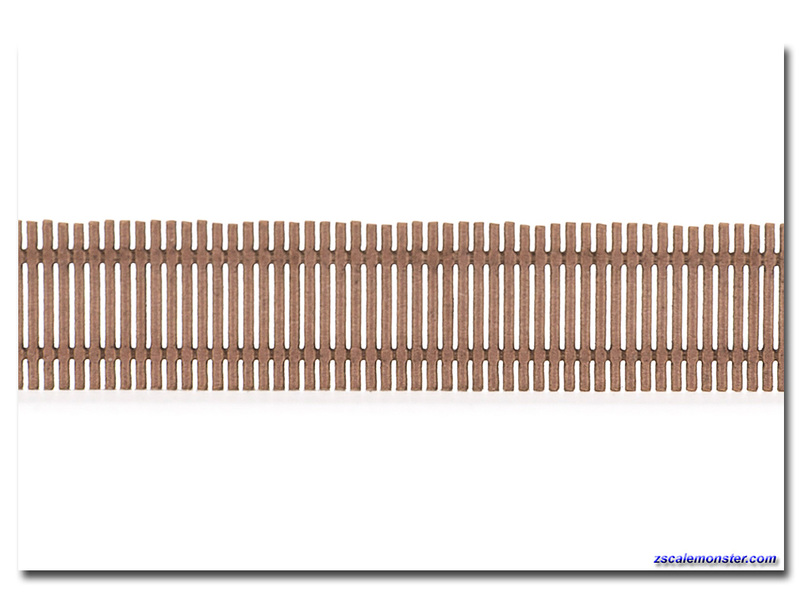 The 'Bw Torrnstein' sliding stage locomotive, designed in the New Objectivity style of the early twentieth century, has five fully continuous track axles, allowing a wide range of possible uses. 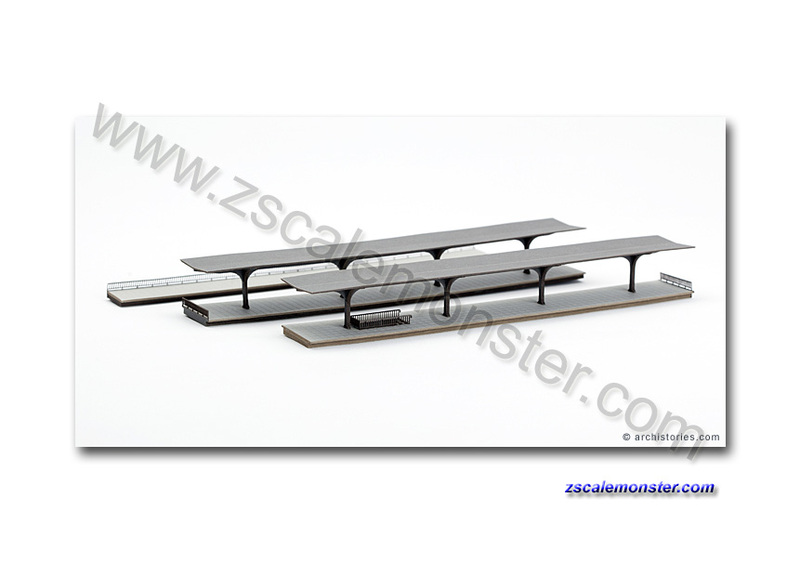 Four skylights and a high proportion of glazed surfaces allow good exposure and thus visibility of the interior. 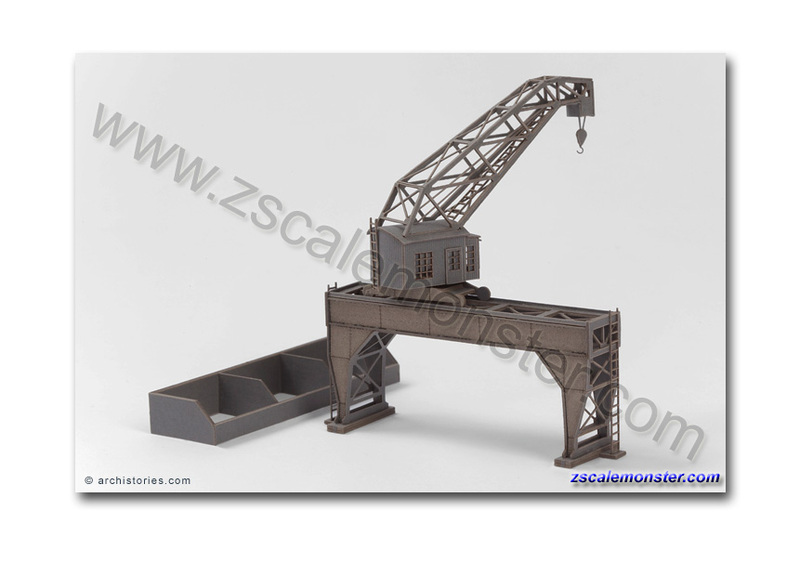 The model is comfortable to build despite very fine components. 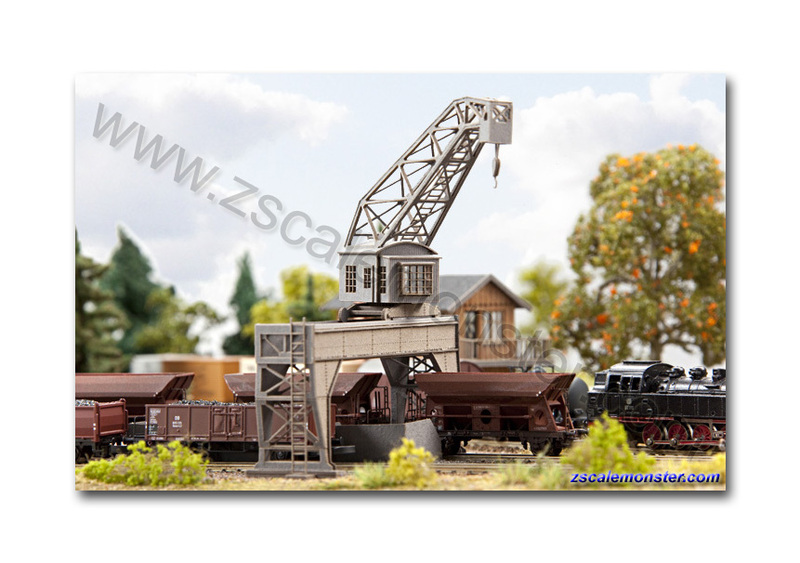 • Transfer table and track not included. 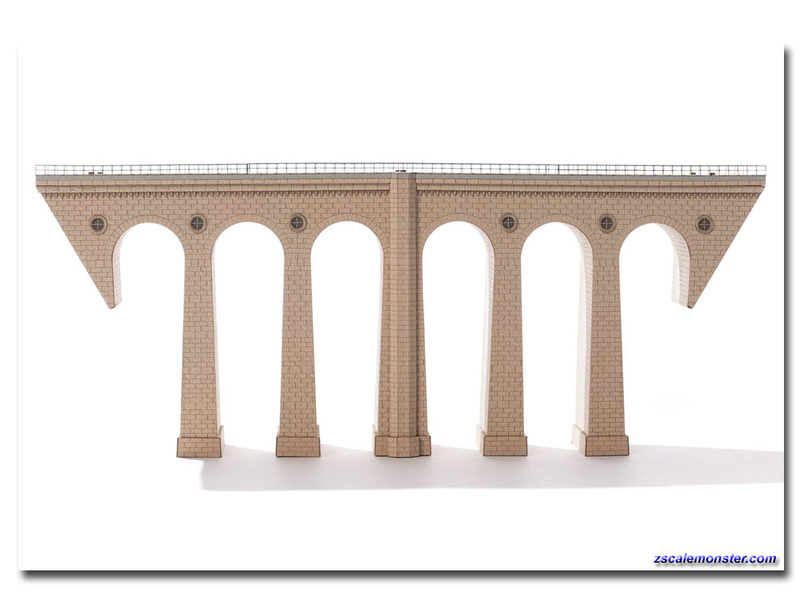 The very famous stone arch viaduct, built in 1853, is located in Altenbeken, Germany. 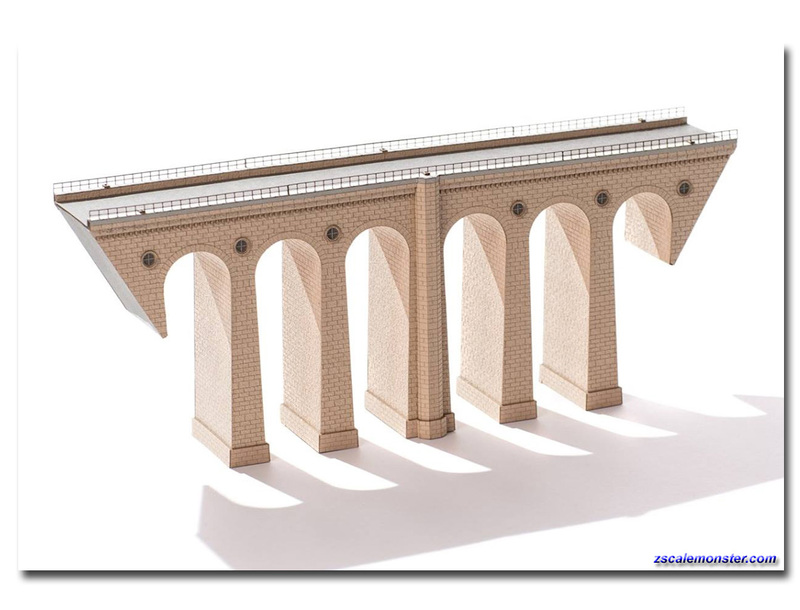 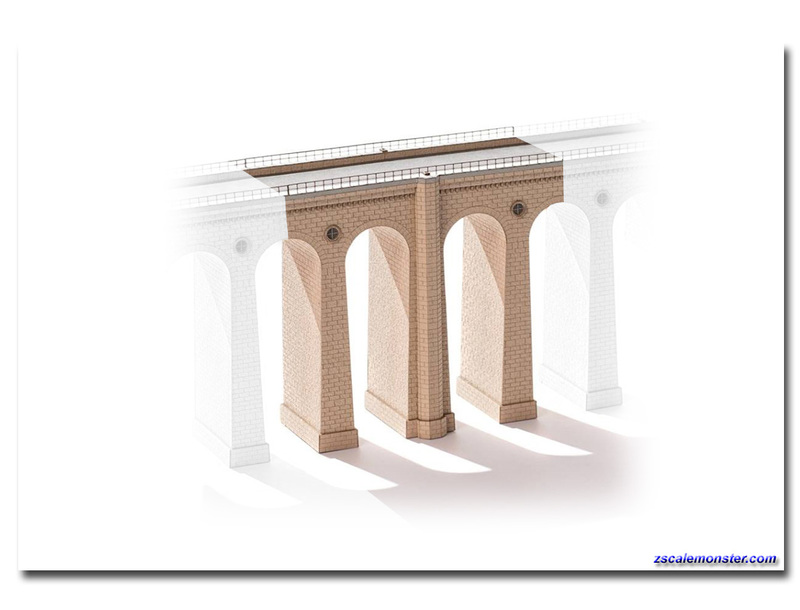 It was the inspiration for this impressive fully modifiable model viaduct kit. 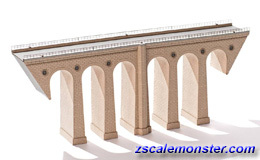 The viaduct can have one or two tracks wide and is also infinitely expandable in length using the add-on kit 129171 (below). 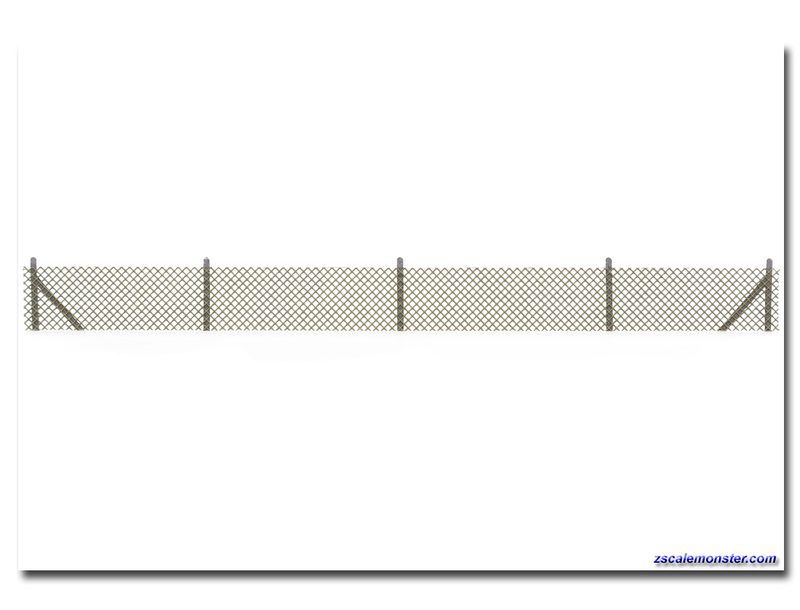 No additional color treatment is required. 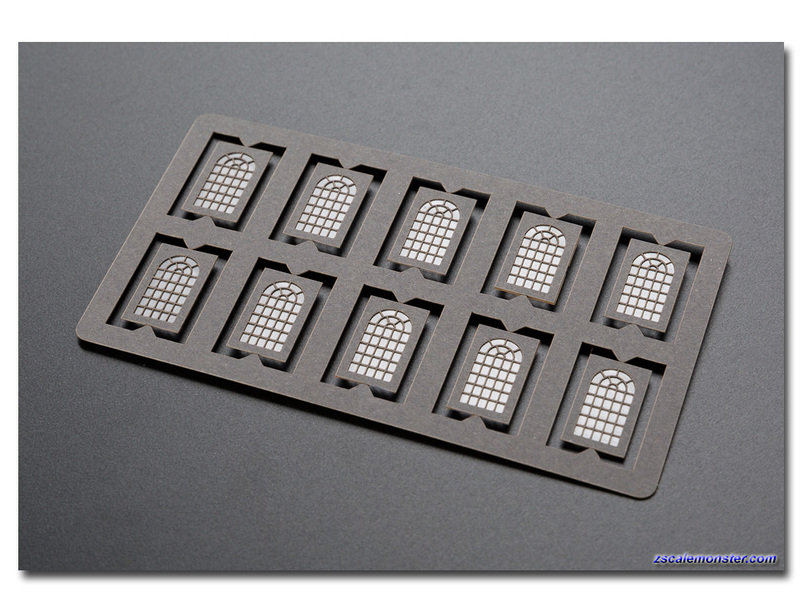 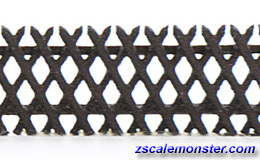 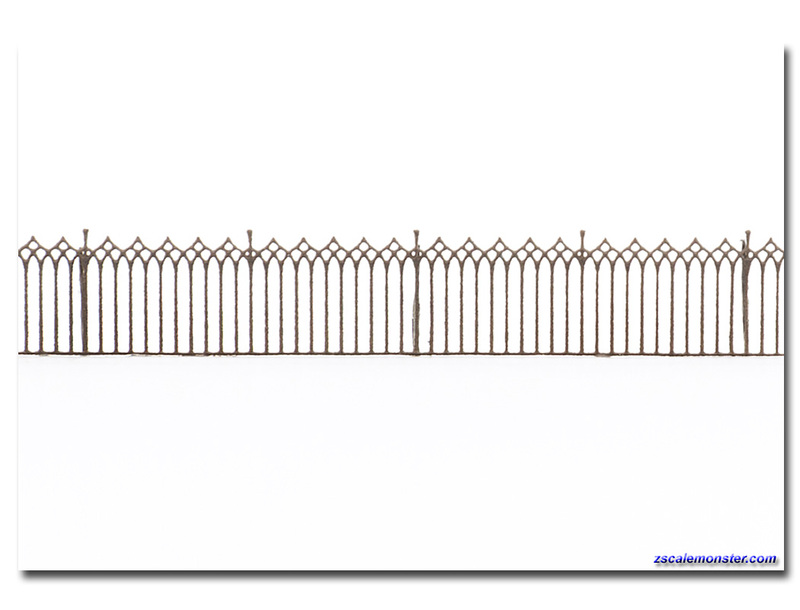 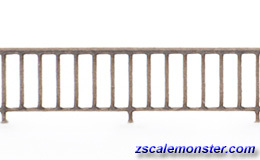 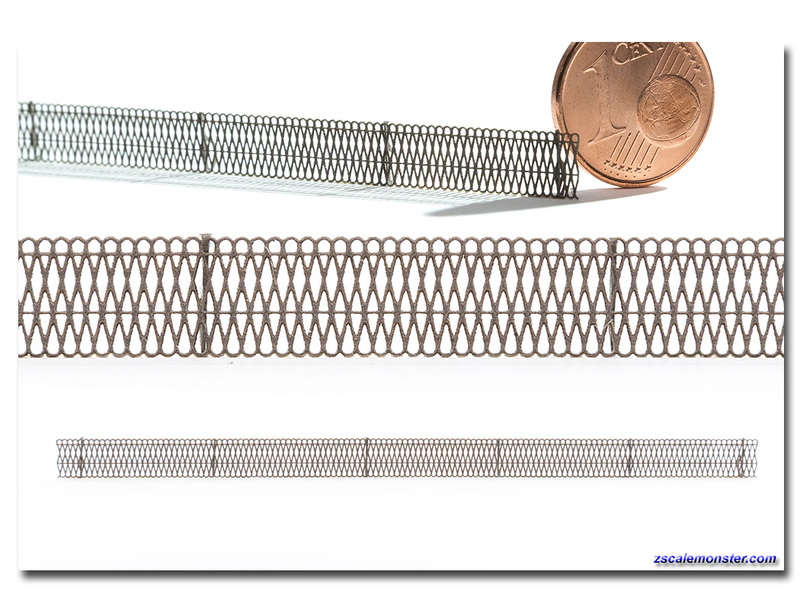 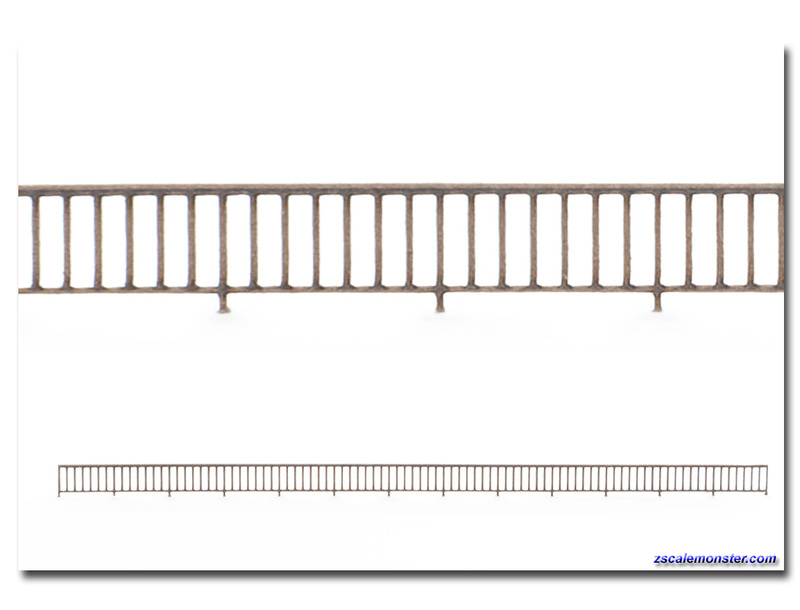 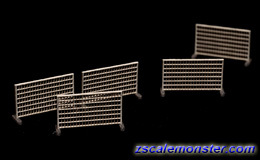 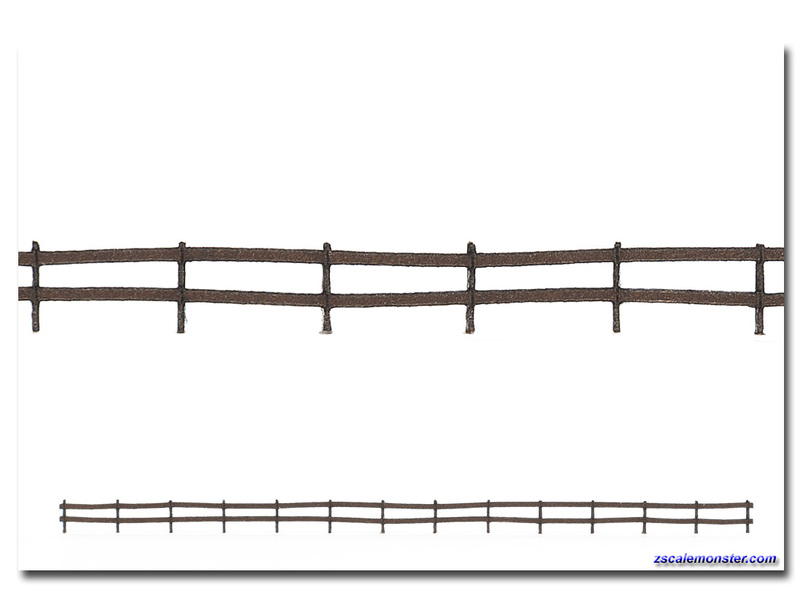 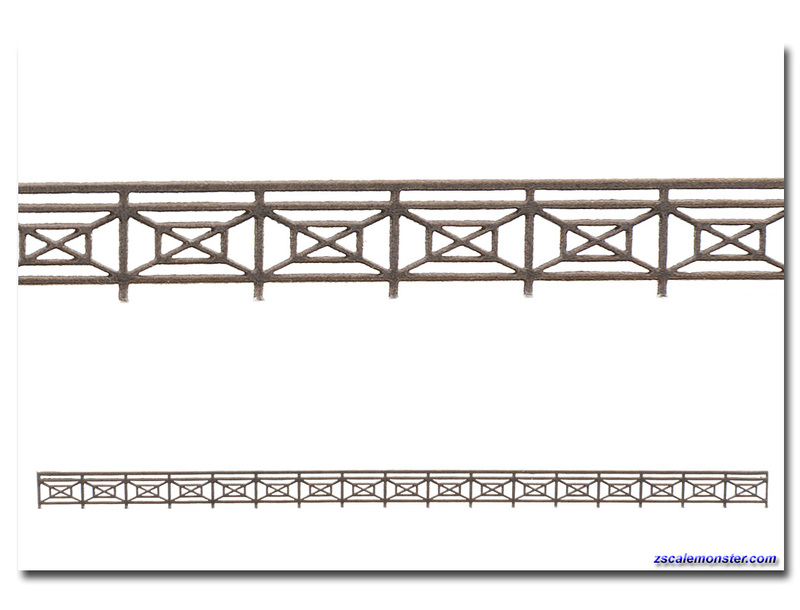 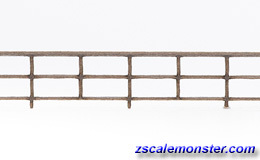 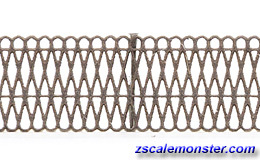 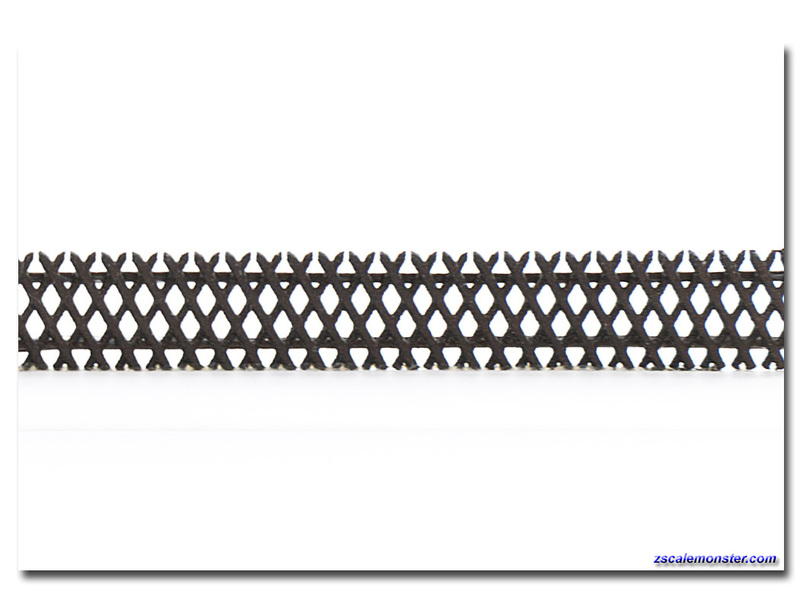 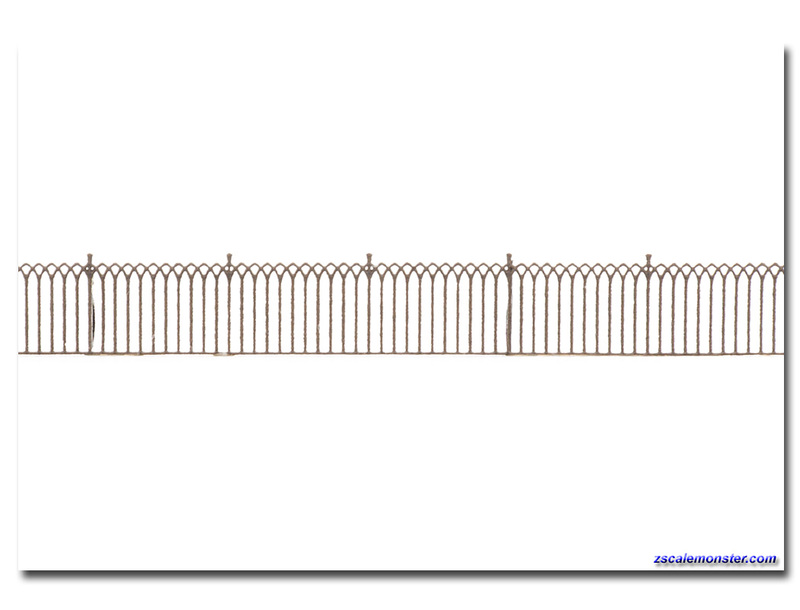 The viaduct Altenbeken kit, and its optional add-on sections, will be the highlight of your layout design. 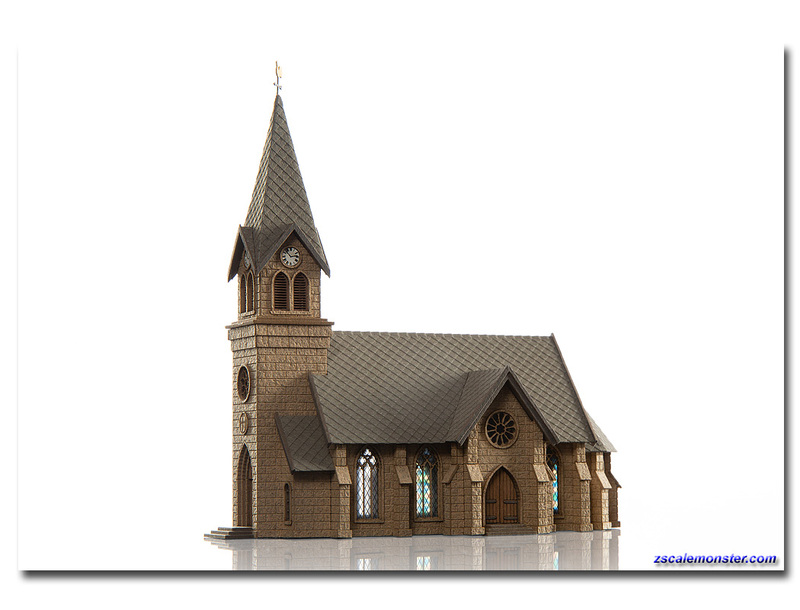 Powerful and simple-looking sandstone masonry, combined with the finest gothic tracery windows, cites a widespread nineteenth-century church style that is often found in both rural and urban settings. 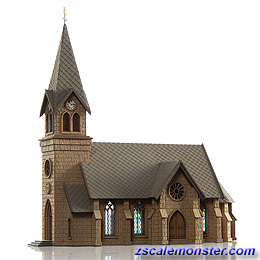 Elaborate details such as four fine tower clocks, fully engraved roof surfaces, real wood doors and window surfaces with partially colored leaded glass offer fascinating impressions. 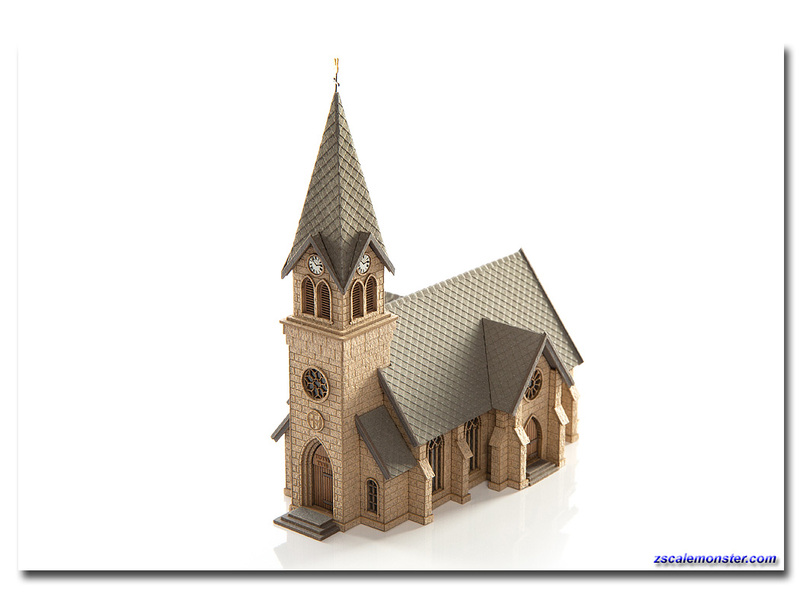 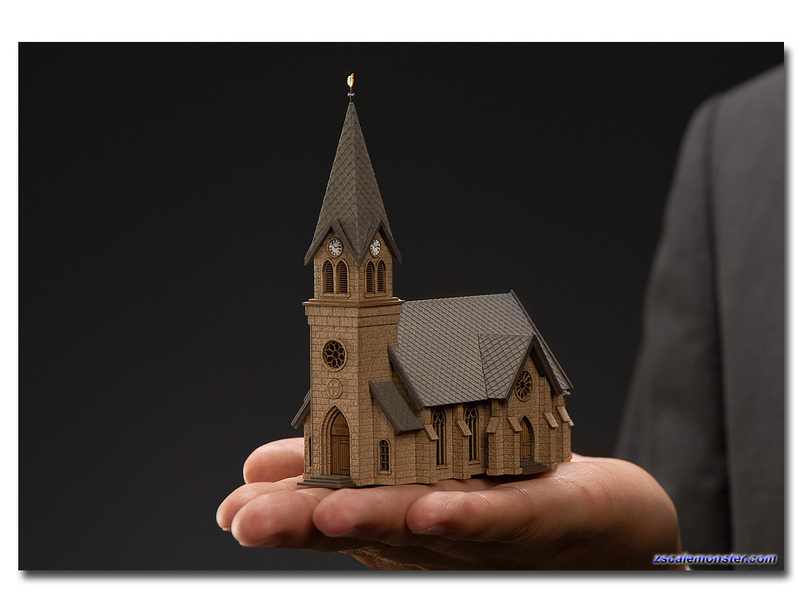 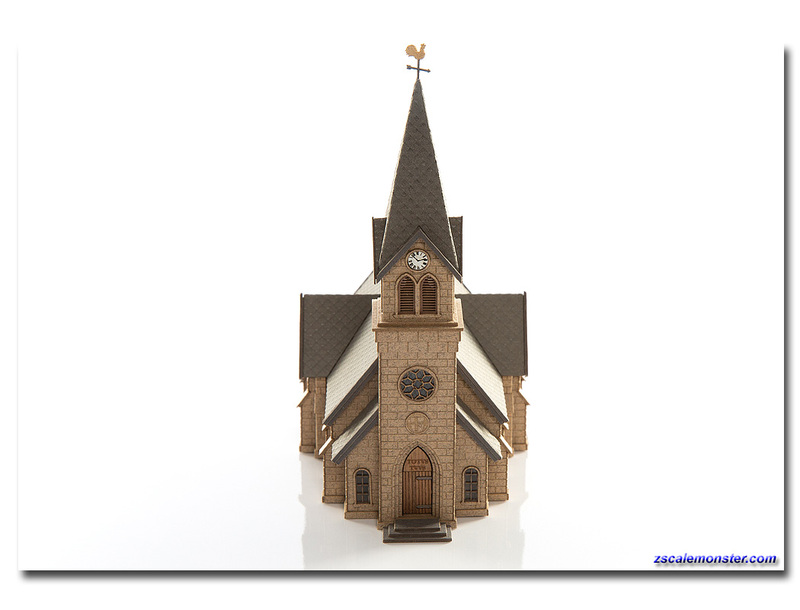 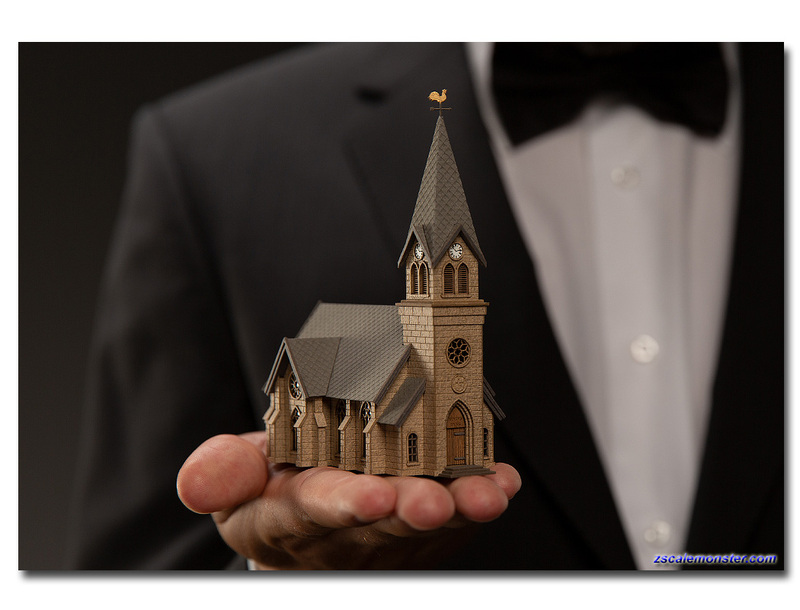 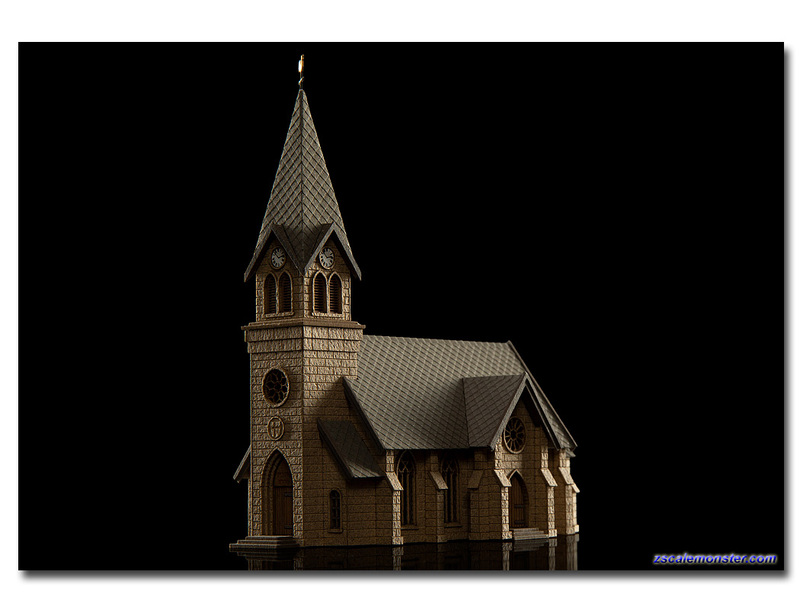 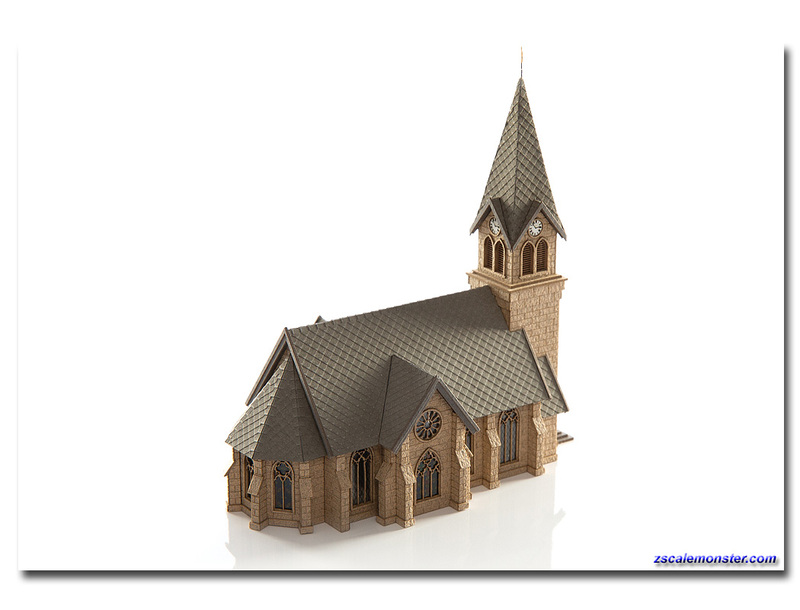 • This neo-Gothic church bears the name of the centennial pope St John Paul II. 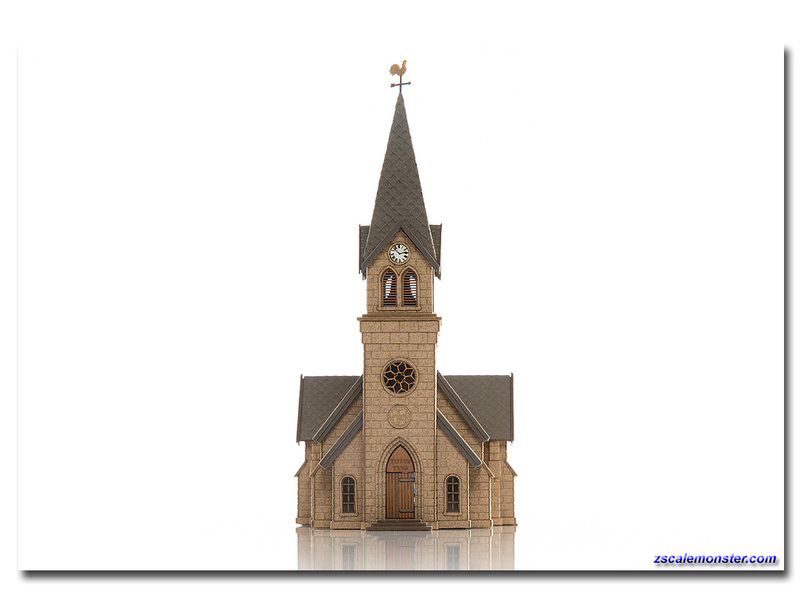 • The coat of arms above the entrance and the slogan 'Totus Tuus' refer to the patron saint, Pope John Paul II. 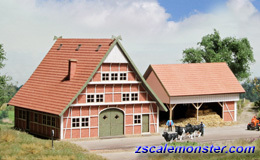 • Farm House with Barn "Kallental"
This farmhouse, and its matching barn, are produced with great detail. 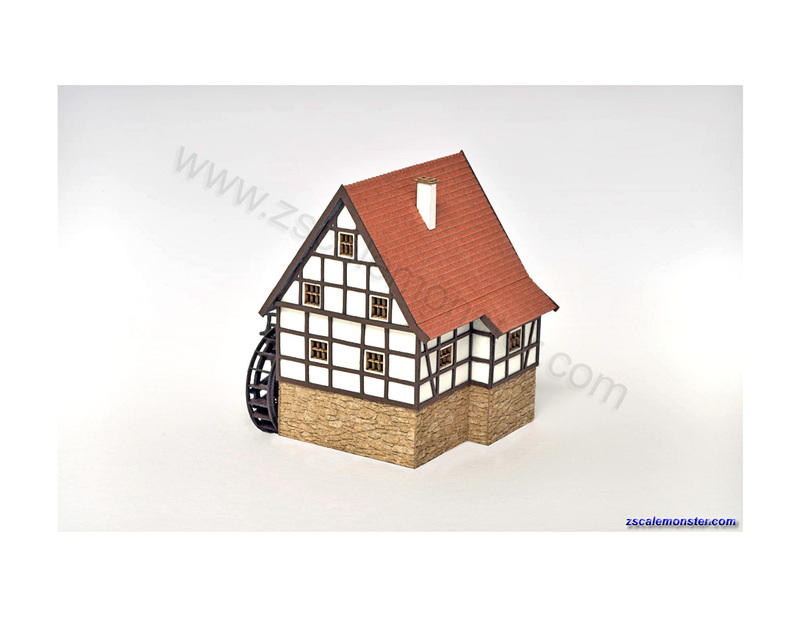 As always, the set is available in two versions: Classic dark brown trusses with white plastered walls found in mid to southern German dioramas, while the red brick infills with white trusses, inspired by motifs from the Old Country, are more Nordic Themes. 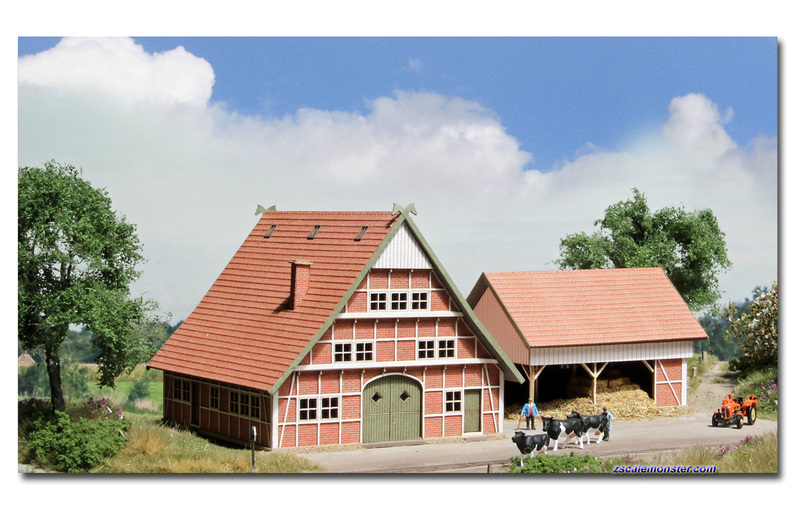 • Hay bales, figures, vehicles, and tractors not included. 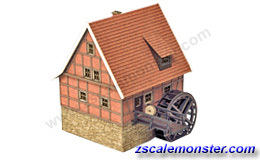 • Farm House with Barn "D�rpeder"
Cooling Tower "Sanders-Werke" Kit • with Smoke Unit! 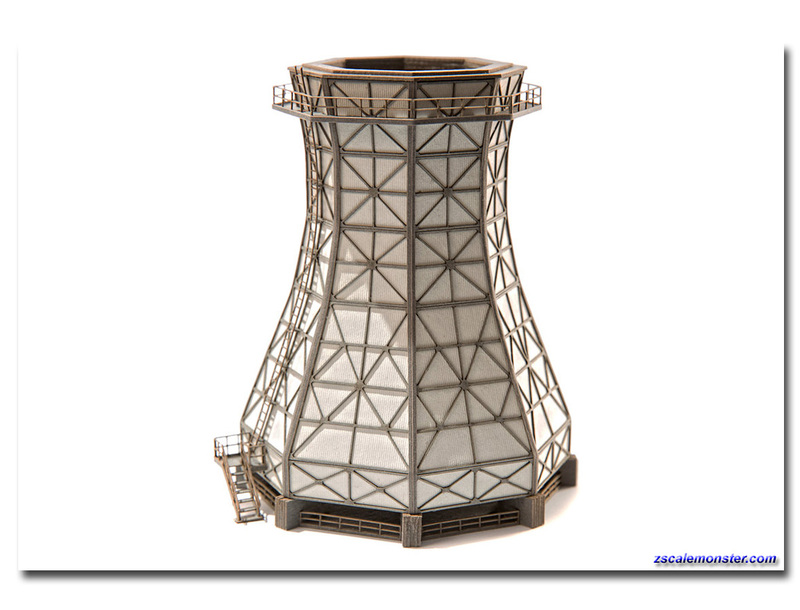 With this impressive and widely visible cooling tower of the 'Sanders-Werke', the topic of plant engineering will continue. 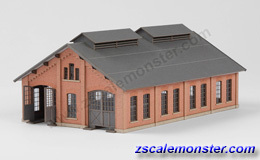 A mighty, but with intricate components elaborately designed building gives your diorama an impressive heavy industrial character. 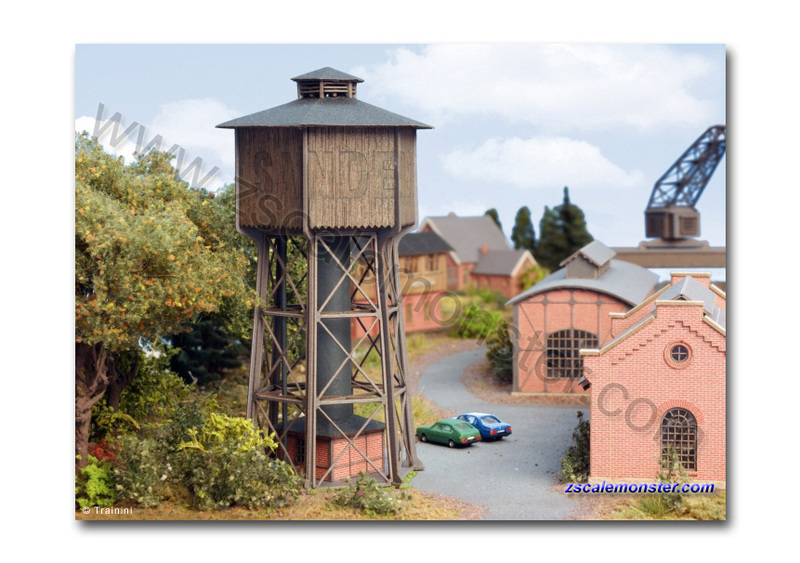 Particularly multiple along linear railway lines juxtaposed, they are magnificent and very realistic impressions. 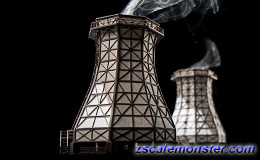 To top it off, this kit is equipped with a high quality Seuthe steam generator and a 10ml vial of steam distillate. 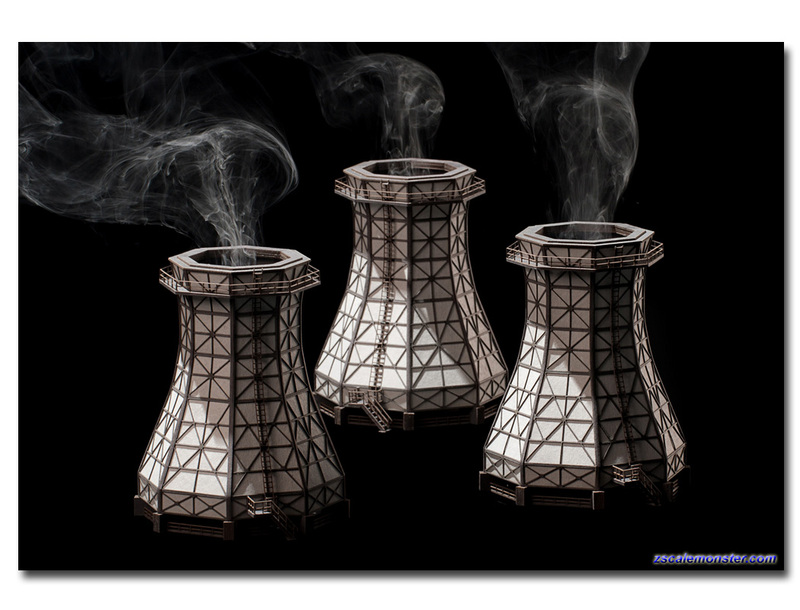 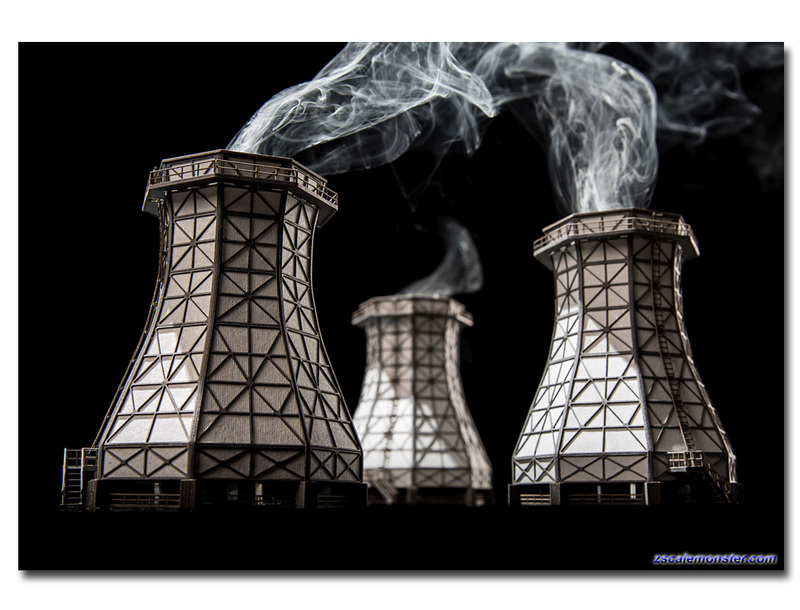 • Use multiple Cooling Towers for more excitement! 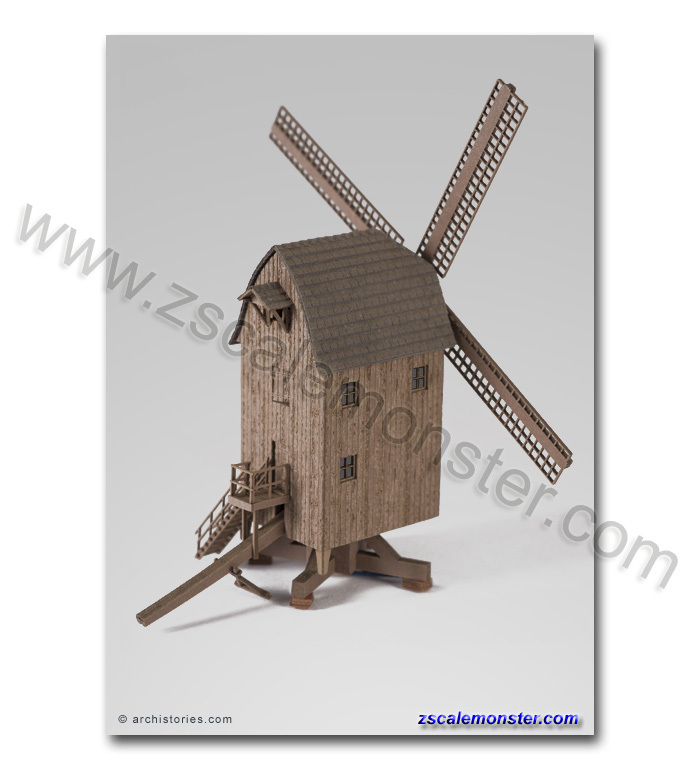 The windmill �Marienfehn' is the oldest and most popular mill design. 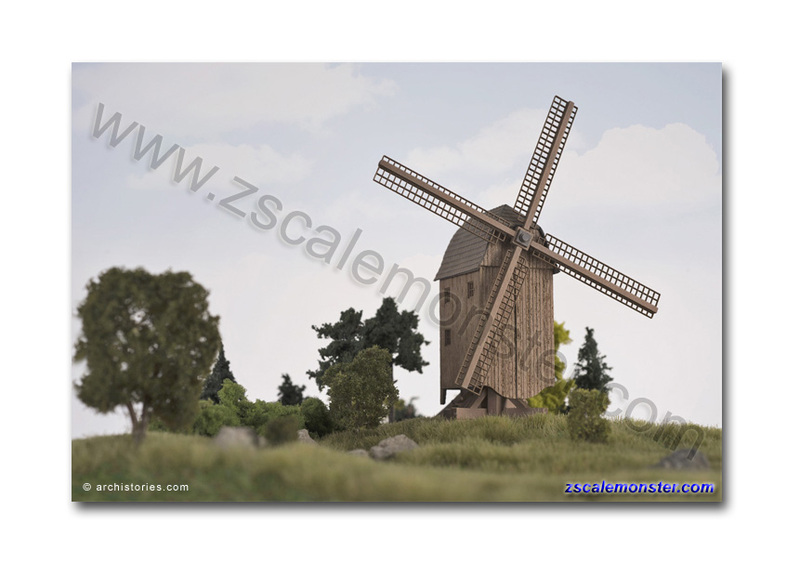 It is a highly detailed statue of a windmill whose example, one of the quite rare' right turners', once stood in Toftum auf Foehr. 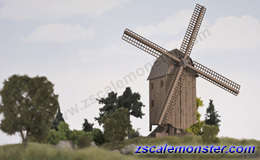 Of course this windmill kit is also equipped with a high-quality drive, allowing for a realistic slow and smooth rotation of the fine mill wings. 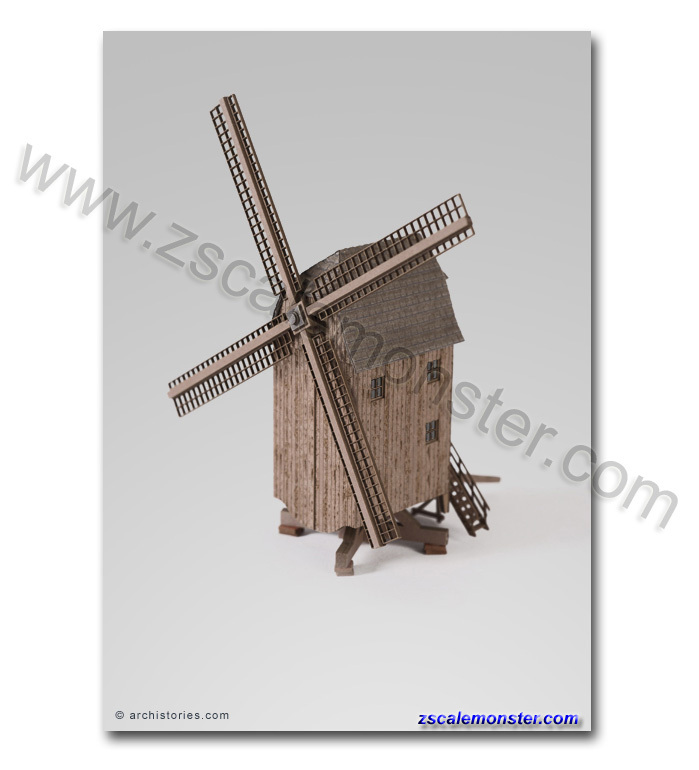 A solid substructure, large-scale wood engraving and a lot of fine separately applied details to make the windmill �Marienfehn� into a universal eye-catcher. 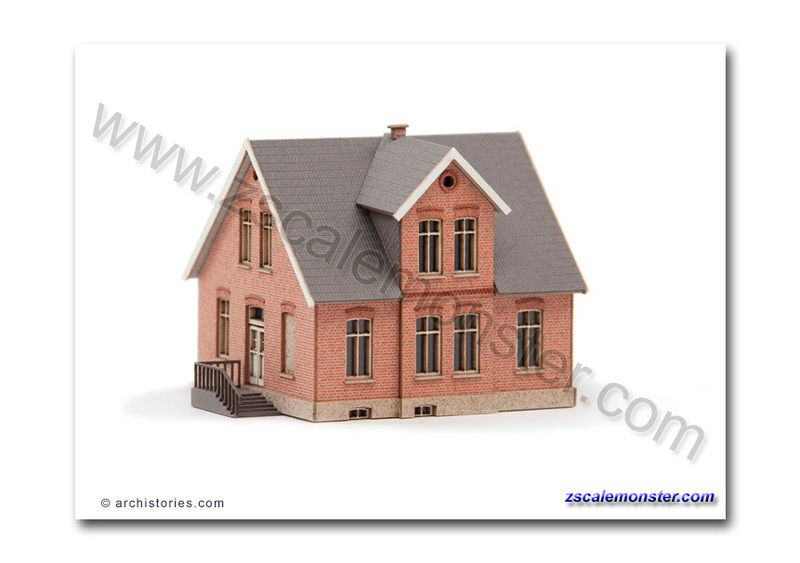 ARCHI STORIES products do not require additional color treatment. 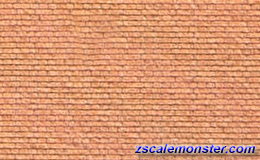 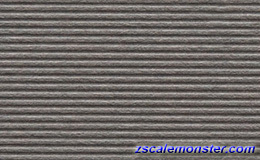 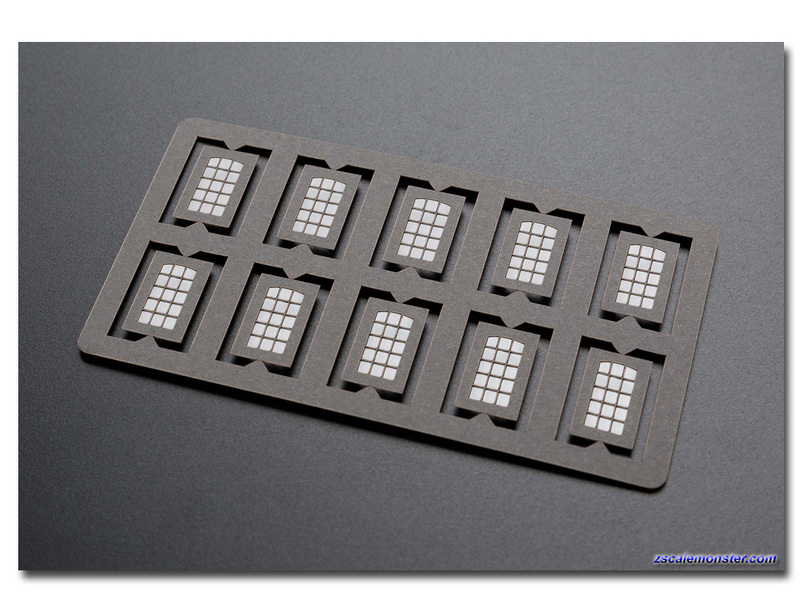 The product images show the colors as supplied. 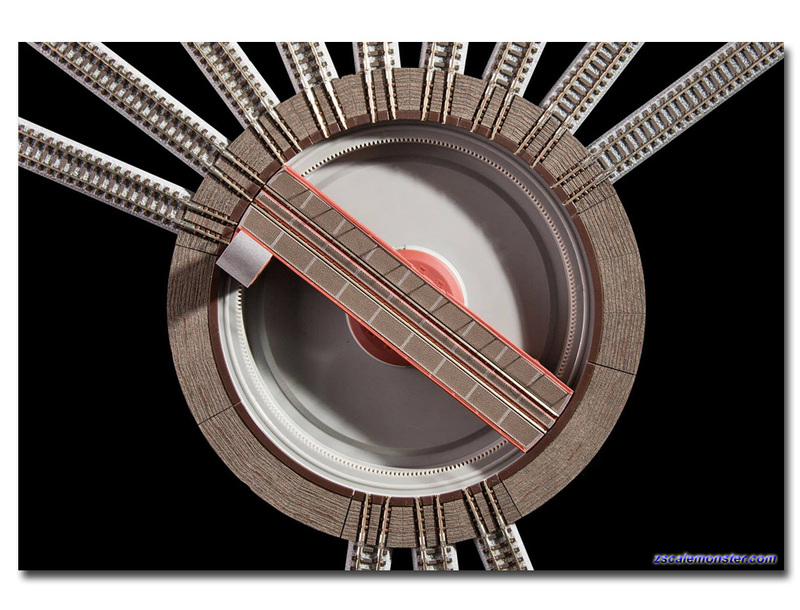 • Simple soldering skills, *Please note our safety! 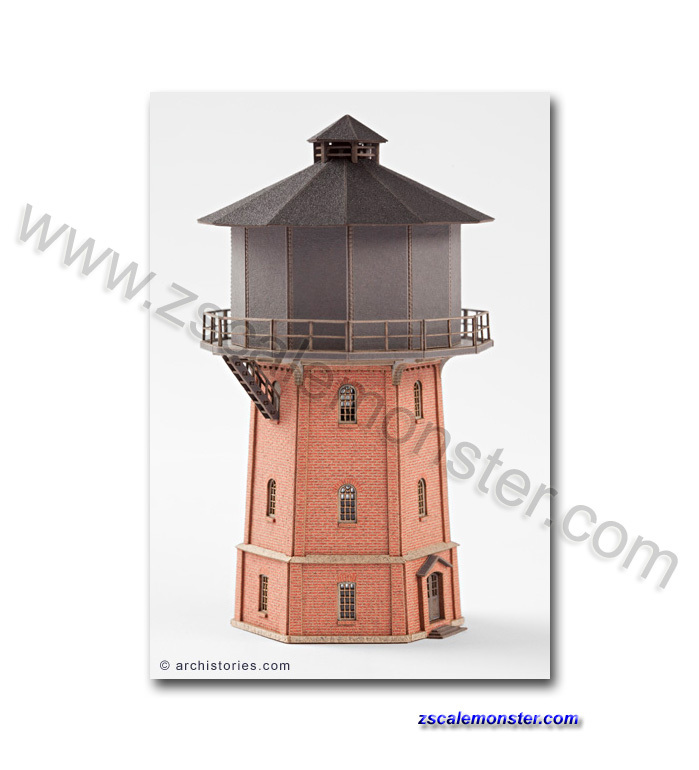 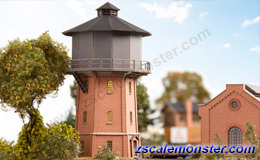 This water tower is quite easy to build and you will fit right in with your layout. 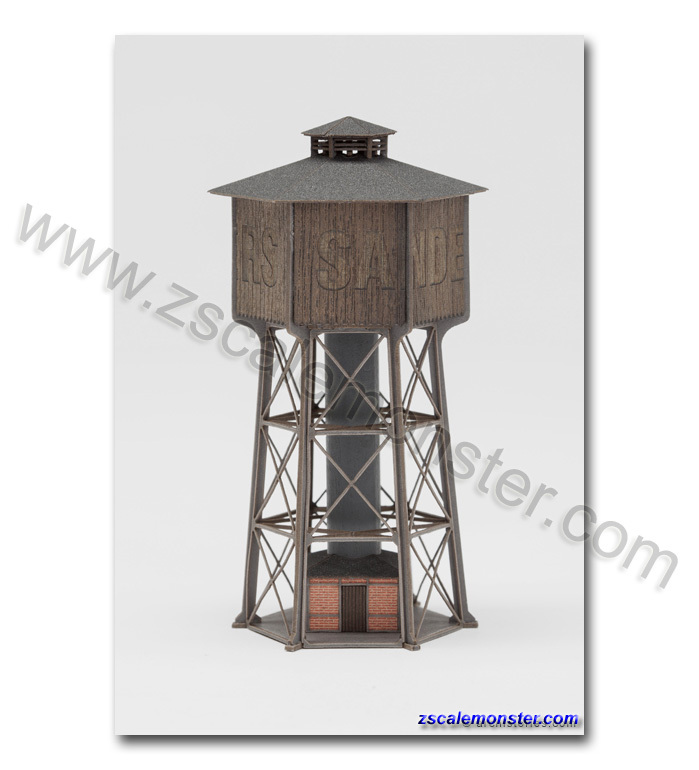 The intricate water tower 'Sanders-art' will be a great fixed point in your industrial ensemble. 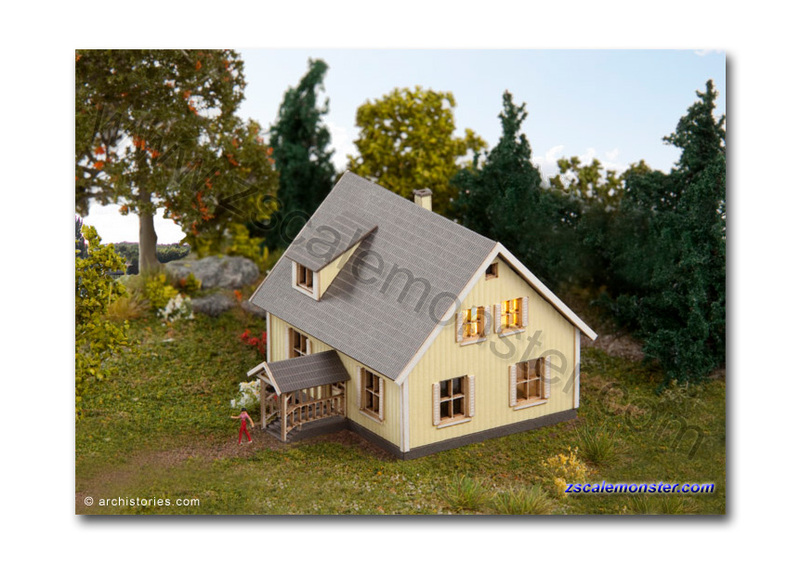 It is also well suited for US dioramas. 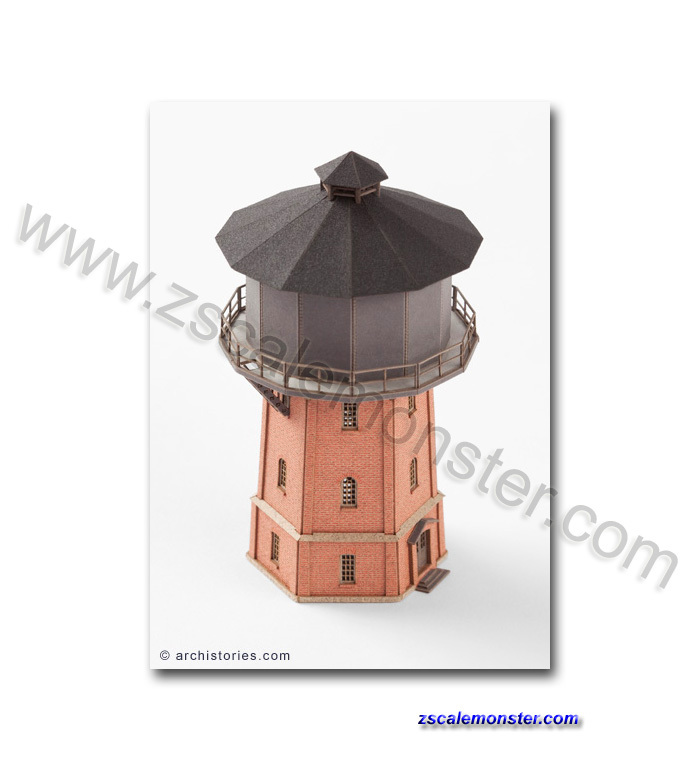 • Located at the base of the water tower is a maintenance cottage that leads to a circular stairwell, all in the center of a complicated filigree supporting structure. 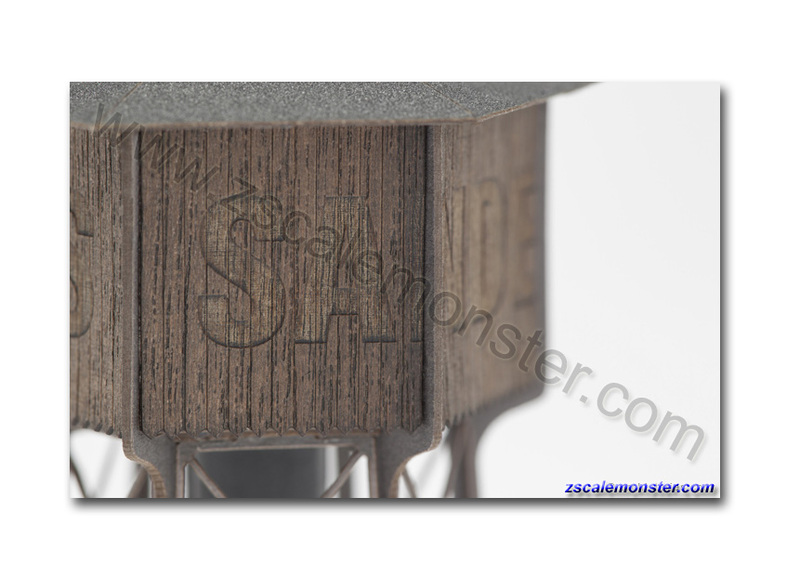 On the top rests a water tank with real wood paneling and weathered 'Sanders' lettering. 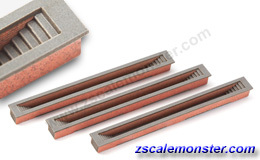 Set of three attractive laid out inspection pits with brick side walls. 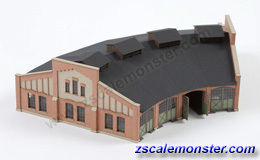 A great addition to your locomotive sheds and or roundhouses. 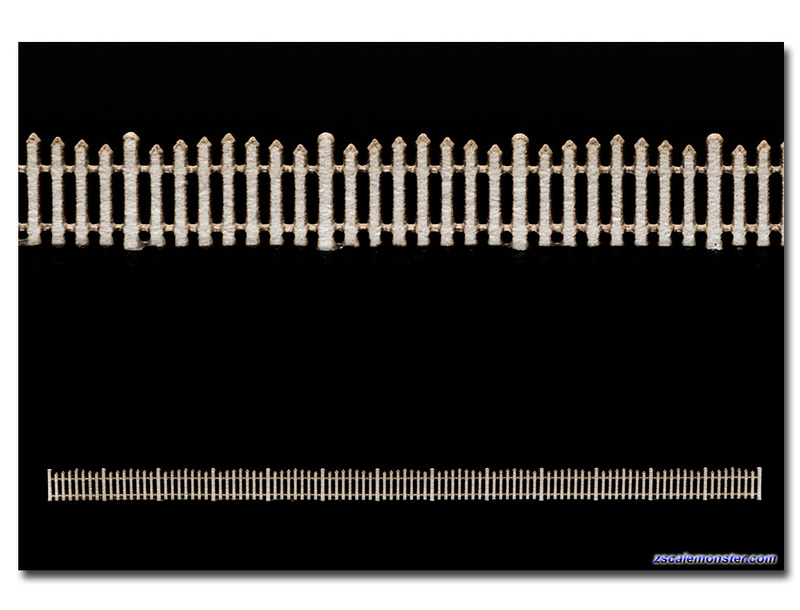 • The tracks run along the frame. 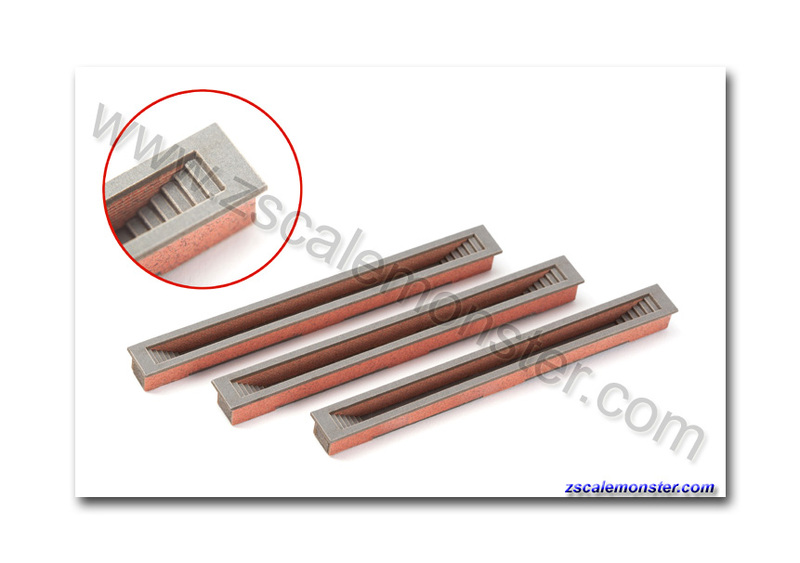 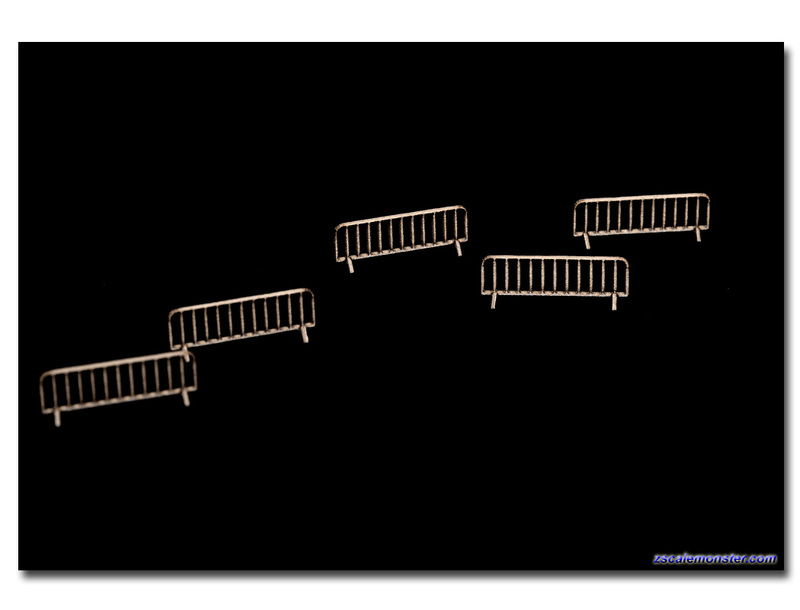 • The pits are embedded in the ground level and the threshold band stick out separately along the length of the pit. 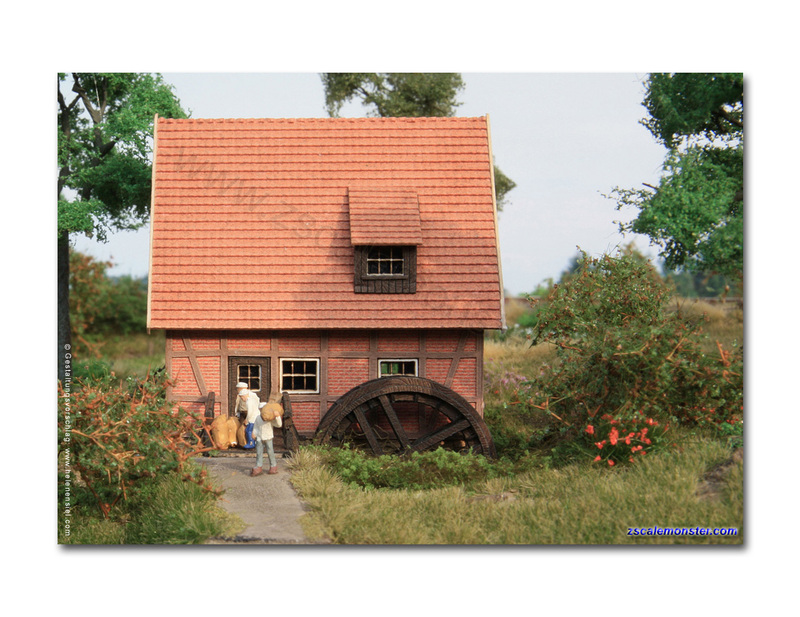 Water mill in the valley of Moosbach. 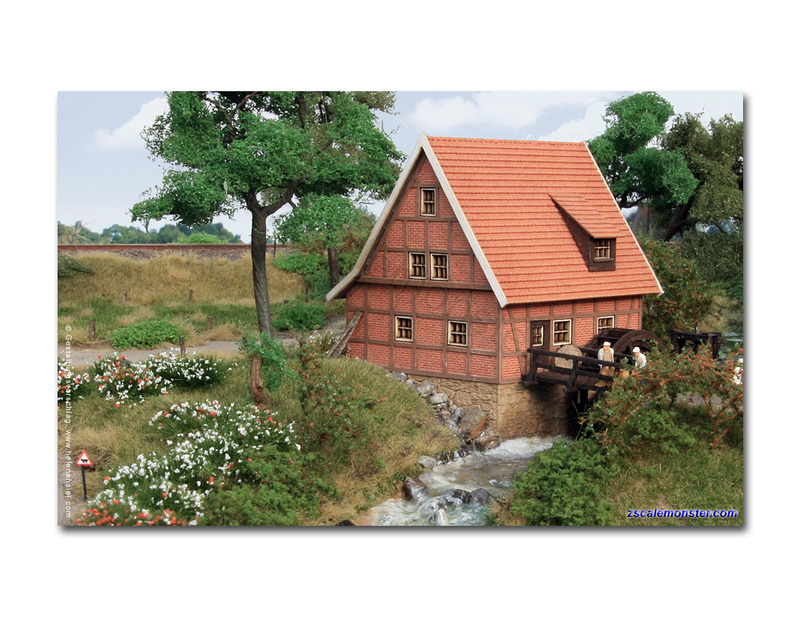 Whether set into a romantic scene (almost hidden in the bushes) or exposed on the side of a river, the 'Water Mill in Moosbachtal' will always be a tranquil spot. 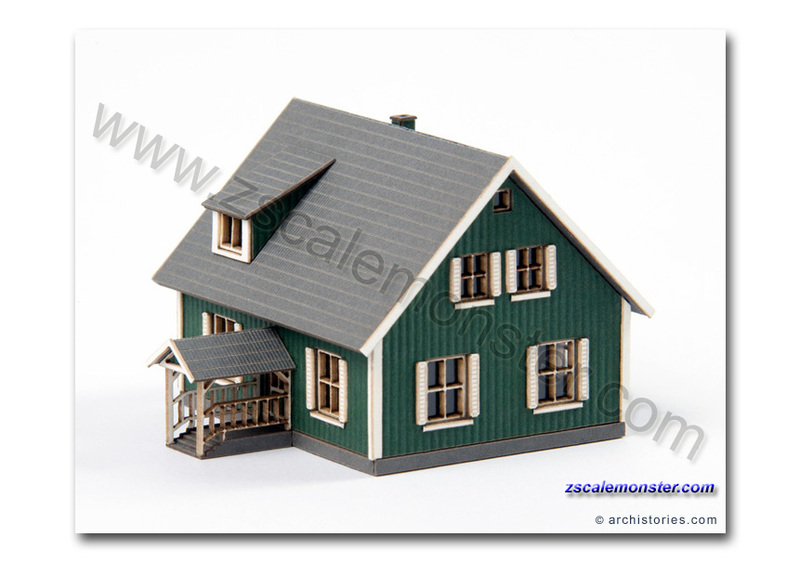 Your guests will have plenty of detail to take in! 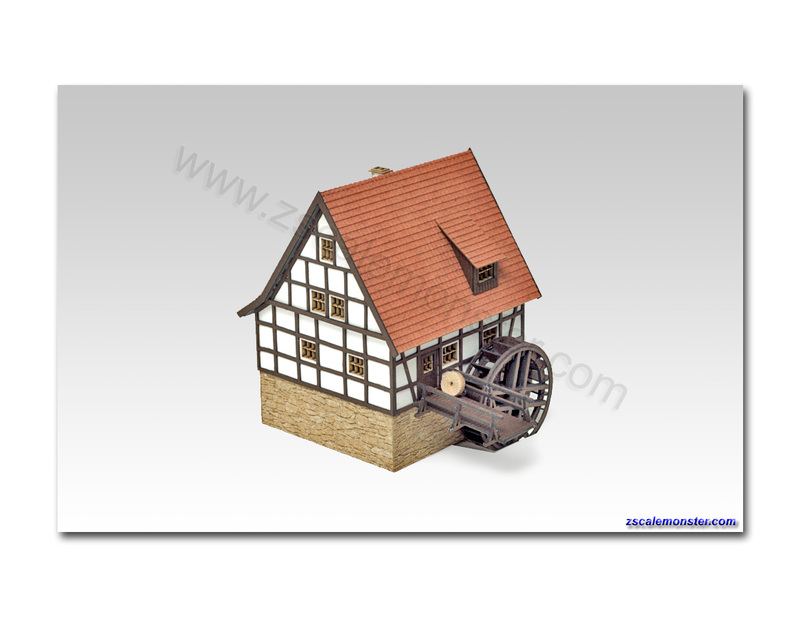 Detail from the fine Fachwerk (timber frame w/ infill) construction to the included micro gear driven, slow turning, mill wheel. 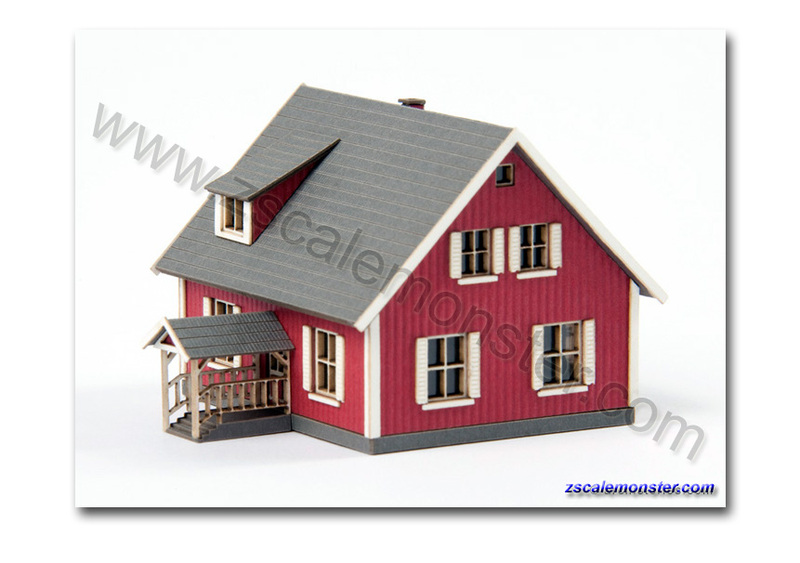 The kit is built over a foundation of natural stones (engraved into the base) and topped off with a tile roof. 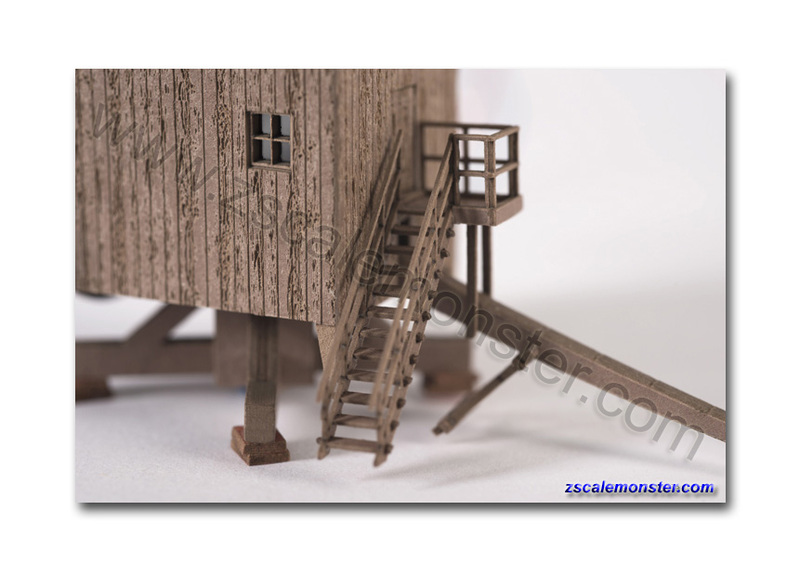 The numerous lovingly crafted details will bring real life to your dioramas. 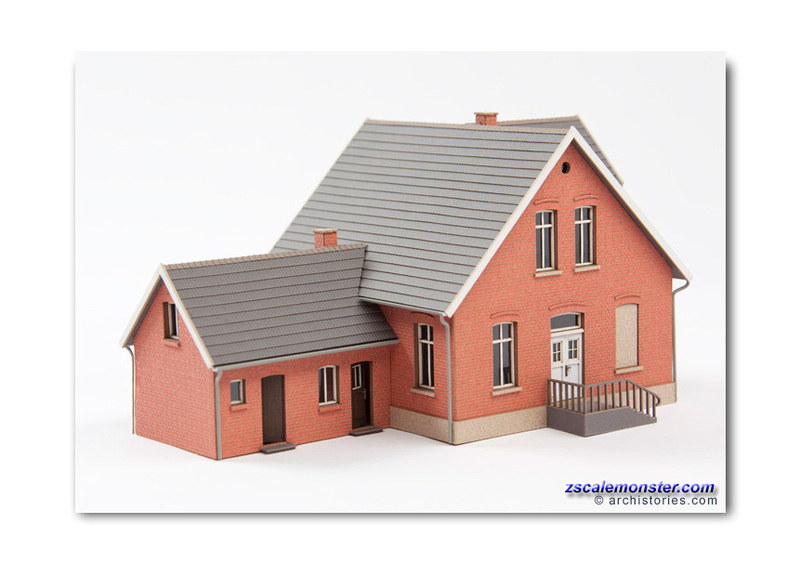 ARCHI STORIES products do not require additional color treatment. 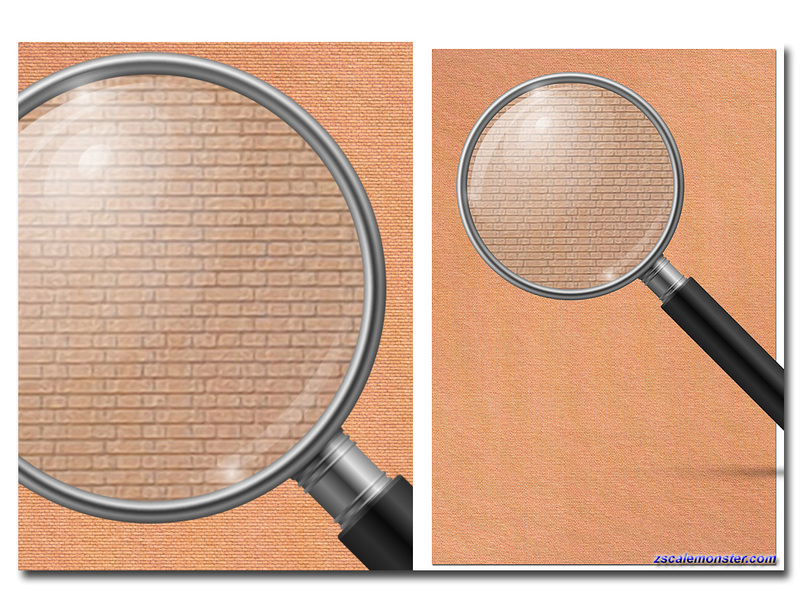 The product images show the colors as supplied. 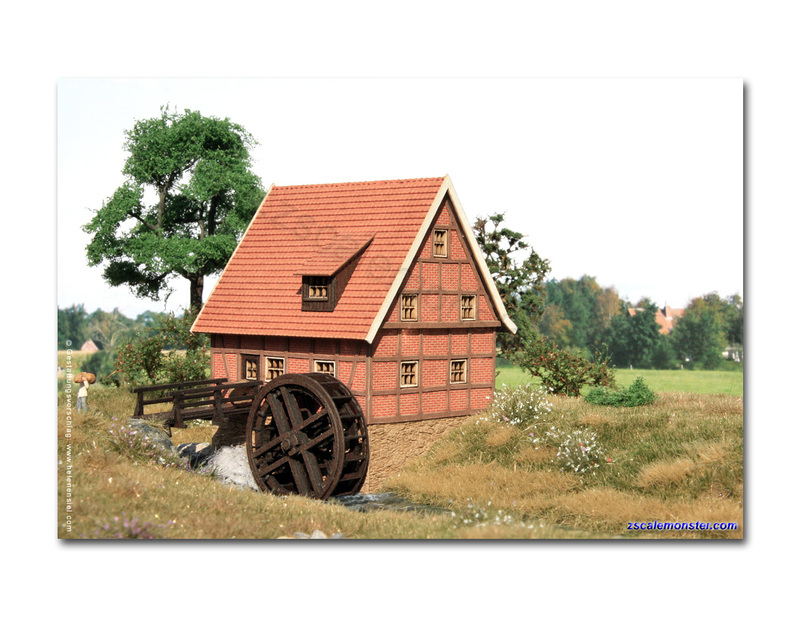 Water mill in the valley of Biberbach. 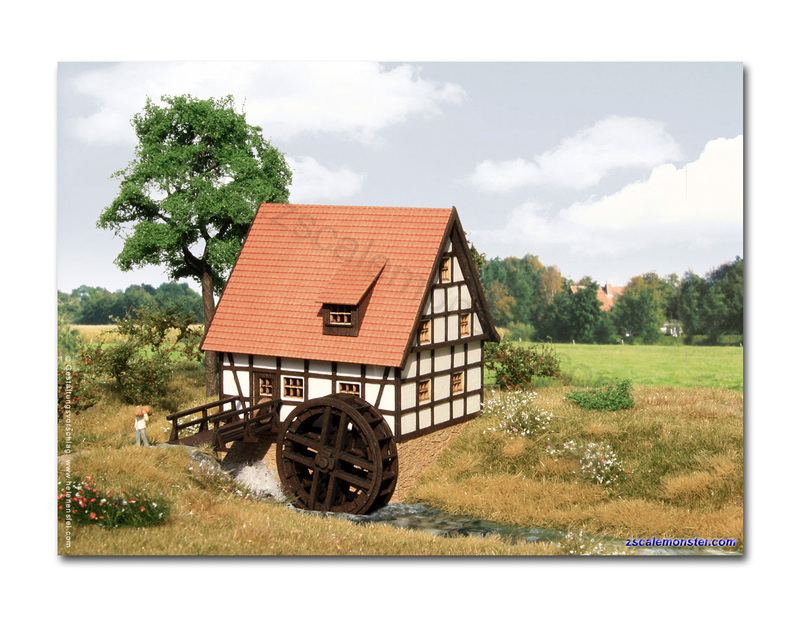 Whether set into a romantic scene (almost hidden in the bushes) or exposed on the side of a river, the 'Water Mill in Biberbachtal' will always be a tranquil spot. 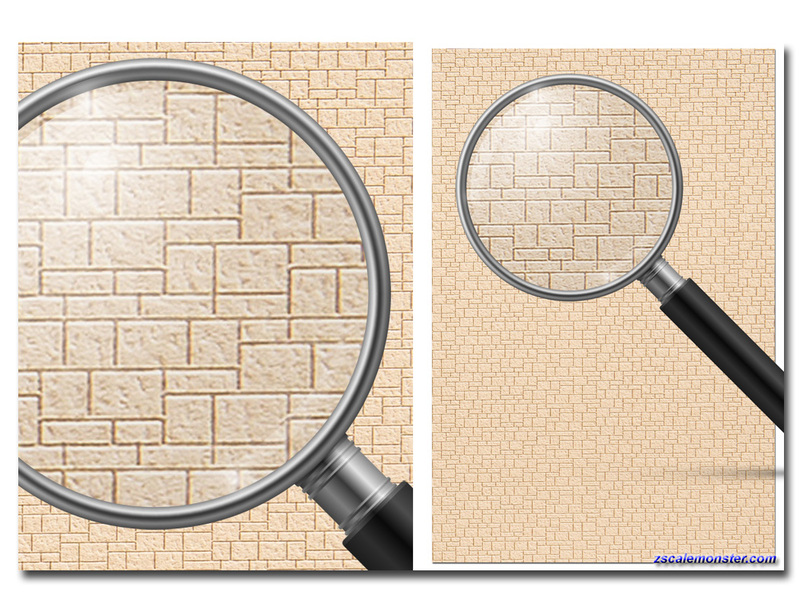 Your guests will have plenty of detail to take in! 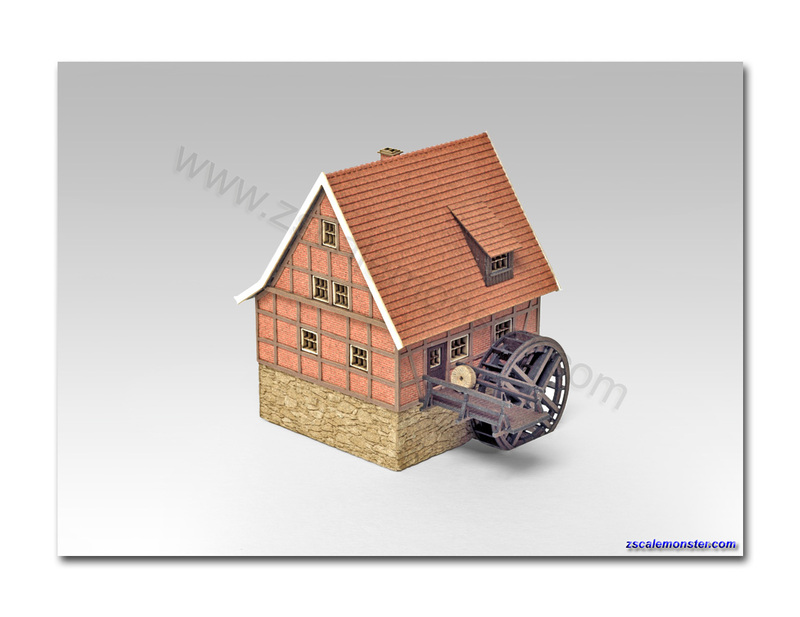 Detail from the fine Fachwerk (timber frame w/ brick infill) construction to the included micro gear driven, slow turning, mill wheel. 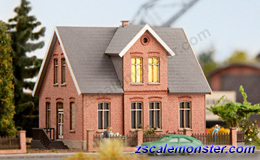 The kit is built over a foundation of natural stones (engraved into the base) and topped off with a tile roof. The numerous lovingly crafted details will bring real life to your dioramas. 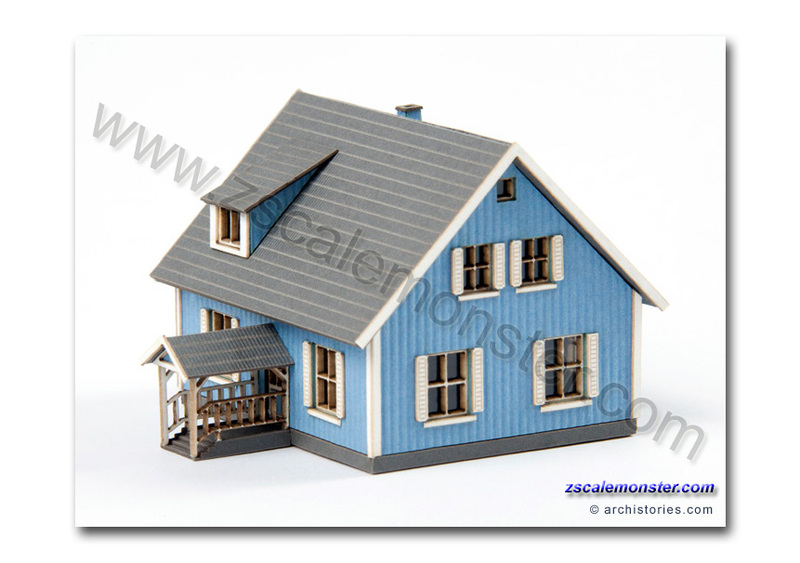 ARCHI STORIES products do not require additional color treatment. 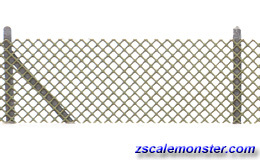 The product images show the colors as supplied. 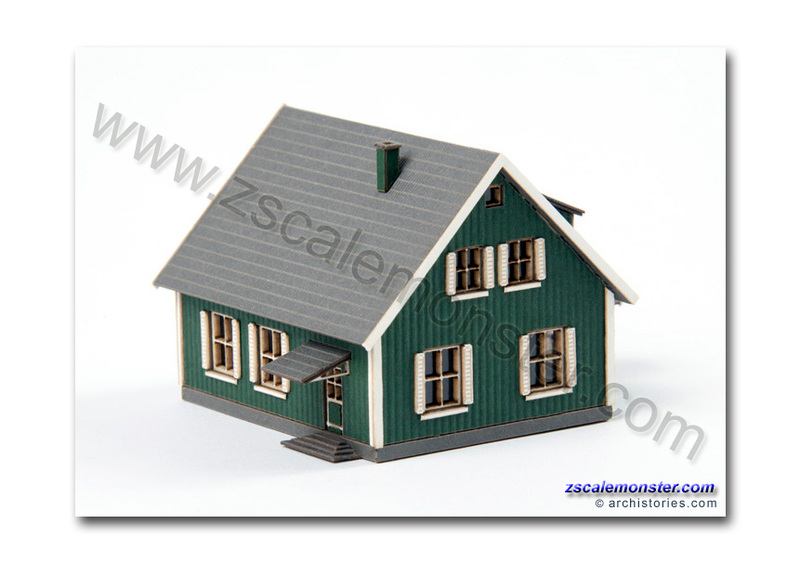 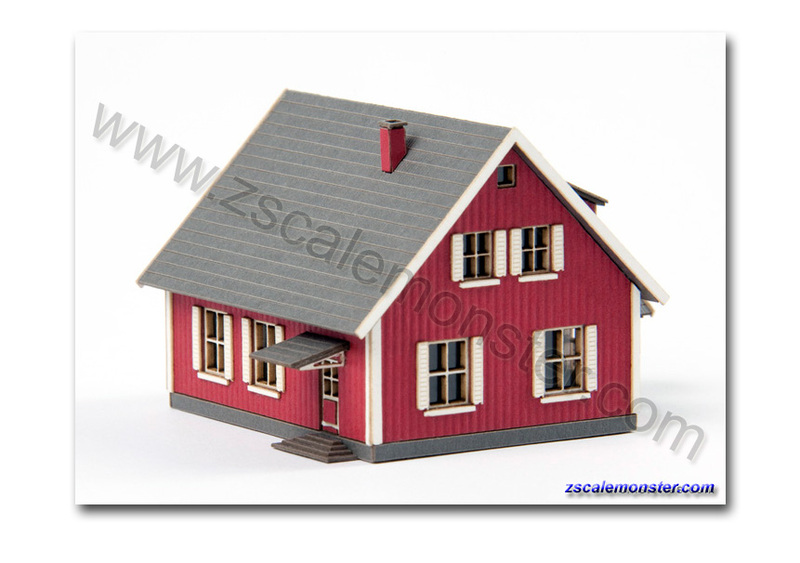 N scale • Locomotive shed "Zollern"
N scale • Water Tower "Bw Torrnstein"
HO scale • Garden shed "Nico Spilt"
#ARC-402104 Garden shed "Nico Spilt"
This small garden house has a permanently flexible door. 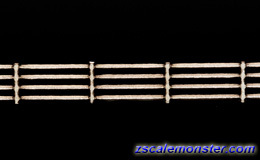 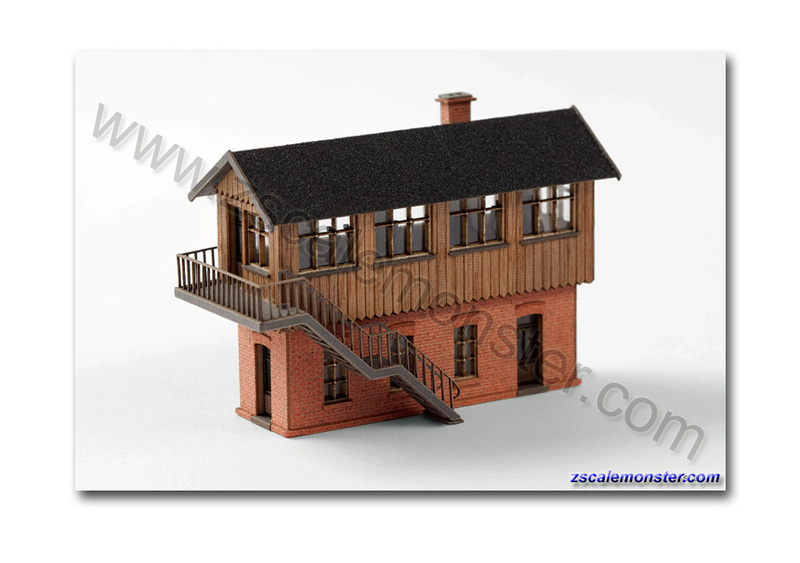 HO scale • Railway House "Frye"